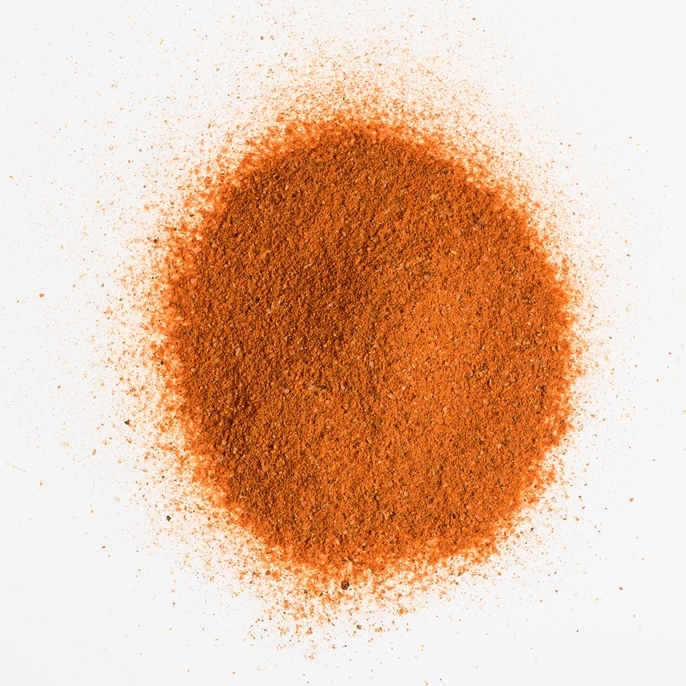 Dry product obtained from the grinding of ripe and clean fruits of Capsicum annuum. Typical smoked aroma. Intense red colour. Sweet: 60-200 ASTA. Hot: 50-150 ASTA. Bittersweet: 60-150 ASTA. 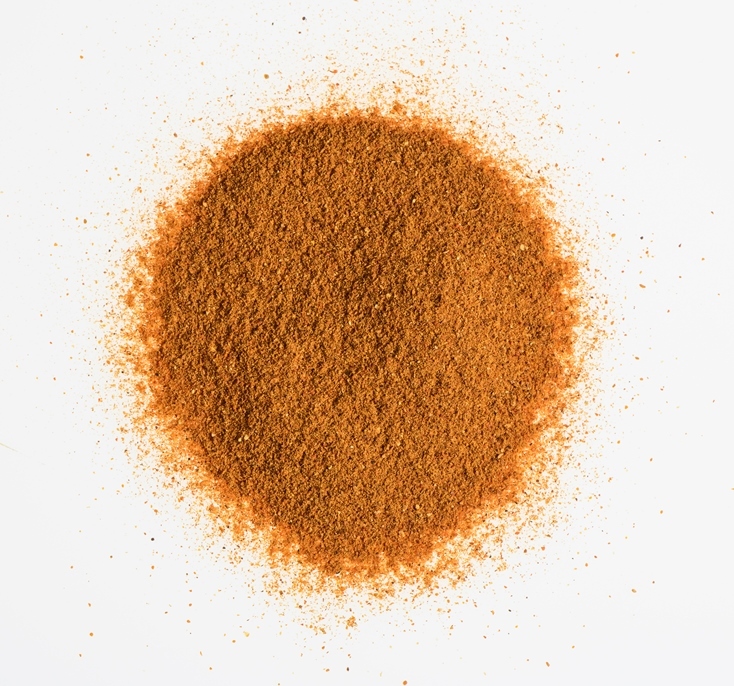 Dry product obtained from the crushing of the ripe and clean fruits of the Capsicum annuum. Sweet taste and typical smoked aroma. Intense red colour. Approximate size 1.5 mm. 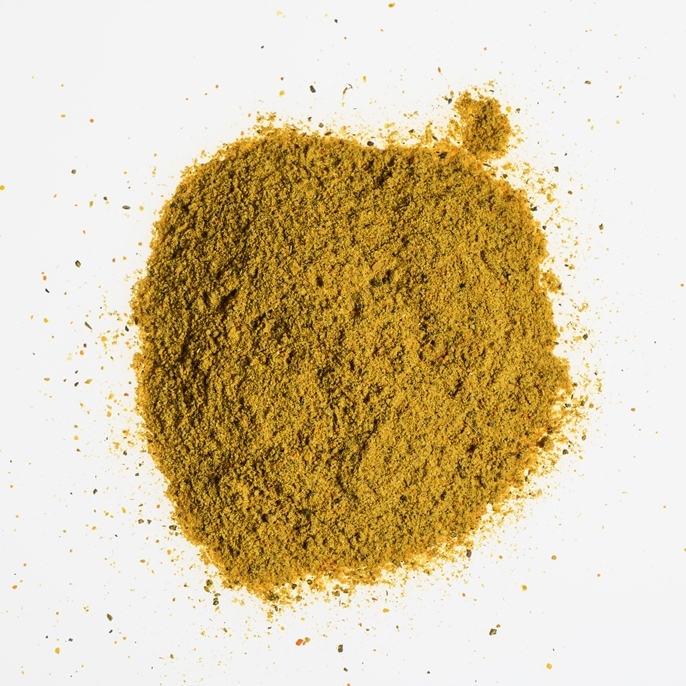 Dry product obtained from the crushing of the ripe and clean fruits of the Capsicum annuum. Sweet taste and typical aroma. Intense red colour. Approximate size 1.5 mm. 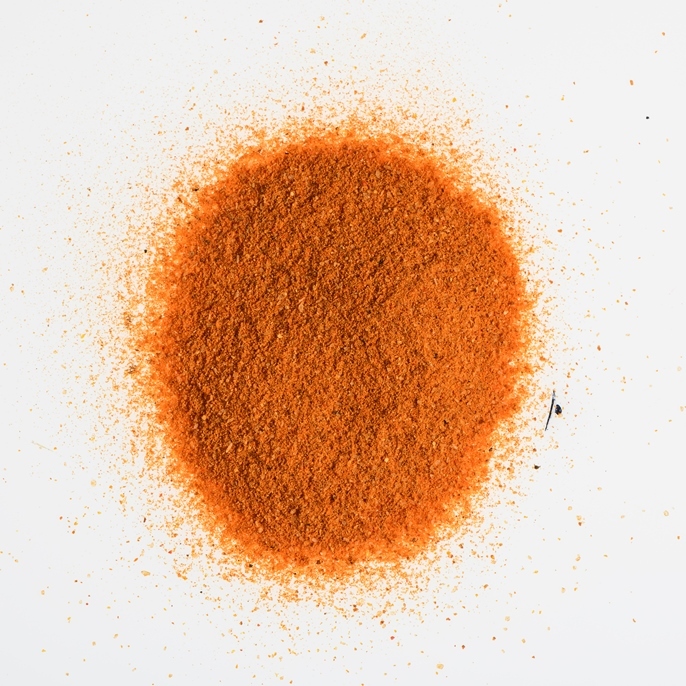 Dry product obtained from the crushing of the ripe and clean fruits of the Capsicum annuum. Spicy flavour and typical aroma. Intense red colour, 80-150 ASTA. Sweet taste and typical aroma. Standard red colour, 50-80 ASTA. Sweet taste and typical aroma. Standard red colour, 50-100 ASTA. Sweet taste and typical aroma. 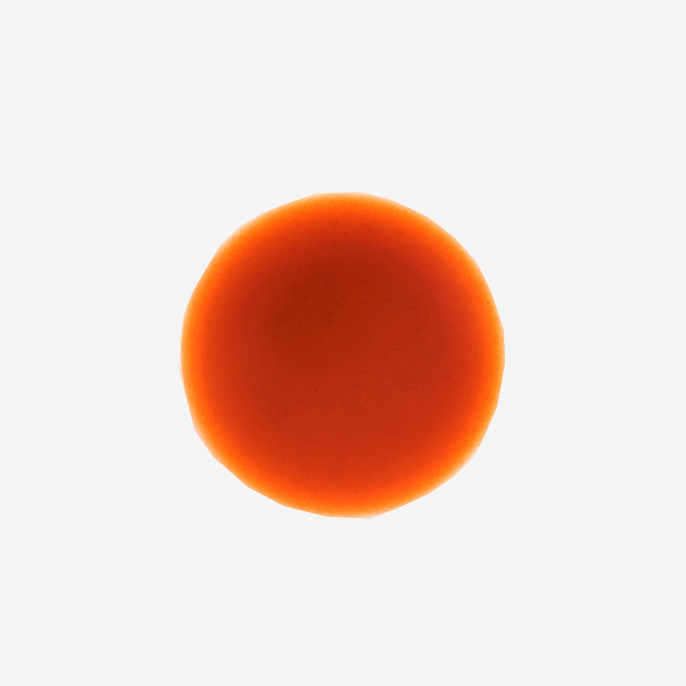 Orangish colour, 80-110 ASTA. Sweet taste and typical aroma. Intense red colour, 90-200 ASTA. Dry product obtained from the crushing of the ripe and clean fruits of the Capsicum annuum. Steam treated. Sweet taste and typical aroma. Red colour, 50-150 ASTA. 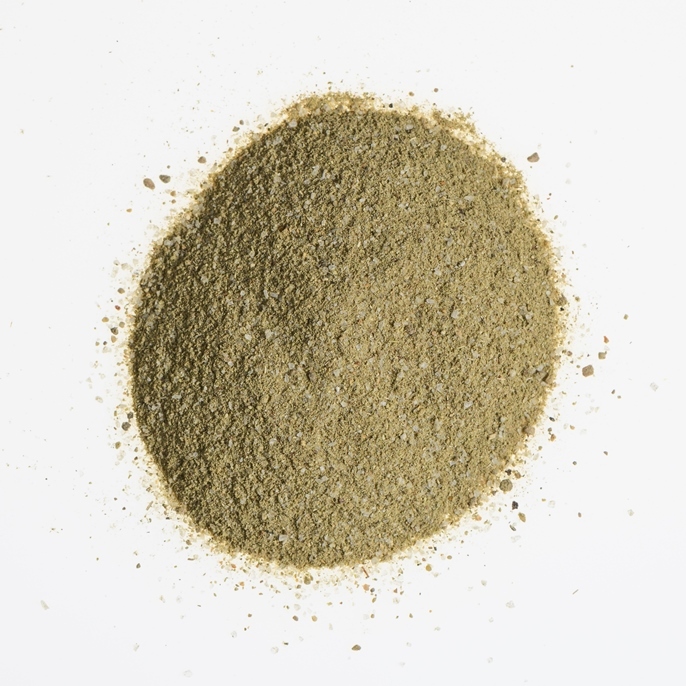 Clean, dry and crushed fruits of Capsicum frutescens. Intense aroma and mediumspicy flavour . It might cause sneezing by bringing it closer to the nose. Ripe, clean and dry fruits of Capsicum annuum. Sweet taste and typical aroma. Intense red colour, 150-220 ASTA. Sweet taste and typical aroma. Clean, dry and ground fruits of Capsicum frutescens. 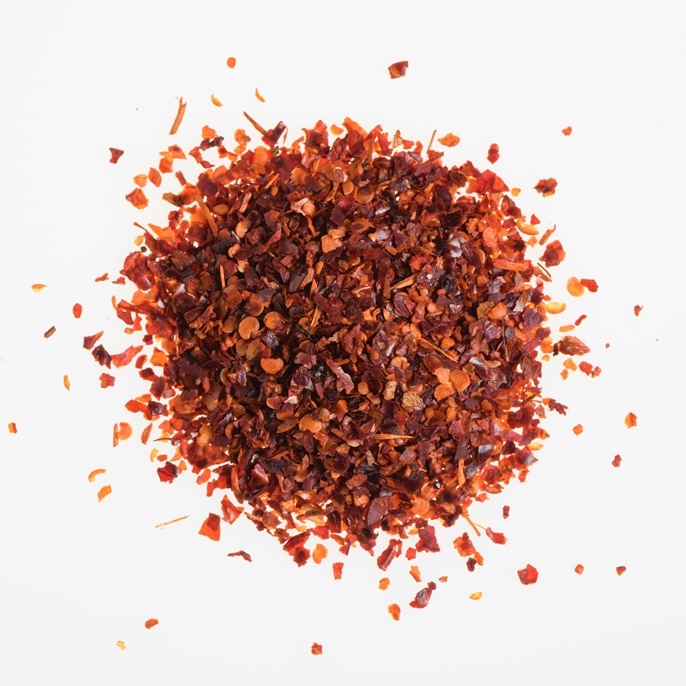 Intense and strongly spicy flavor. It might cause sneezing by bringing it close to the nose. 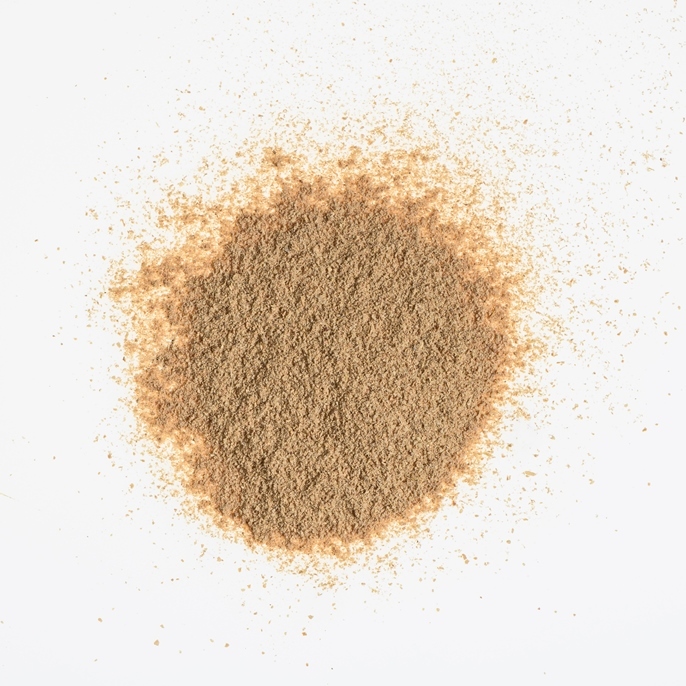 Dry product obtained from the grinding of ripe and clean fruits of Capsicum annuum. 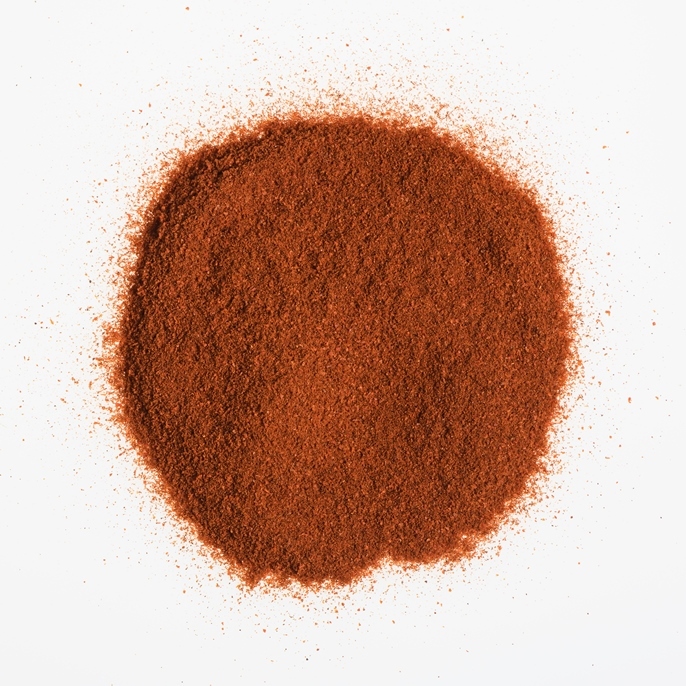 Sweet or spicy taste and typical aroma. Colour according to customer’s requirements, between 40-180 ASTA. Possibility of steam sterilization. 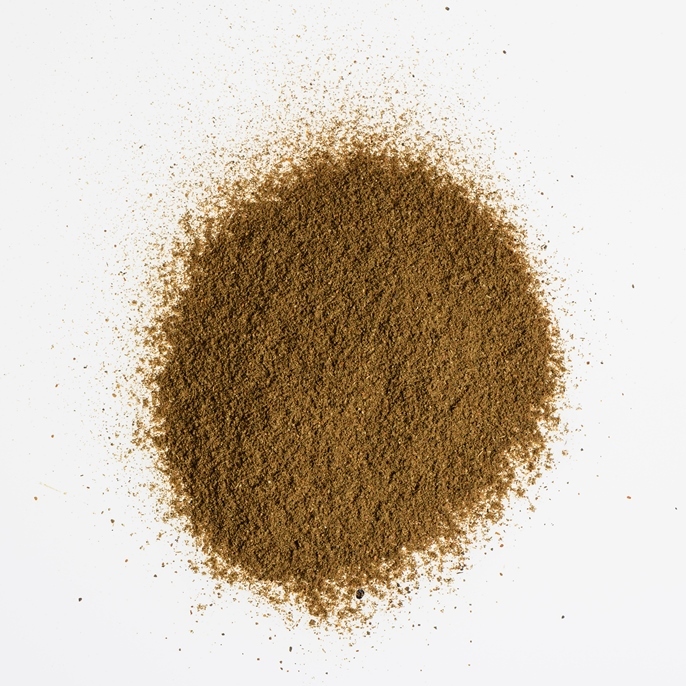 Dry product obtained from the grinding of ripe and clean fruits of Capsicum annuum. Steam treated. Spicy flavour and typical aroma. Red colour, 50-150 ASTA. Whole round, mature, clean, dry fruits of Capsicum annuum. Sweet flavour with typical aroma. Produced in Spain in the Region of Murcia. 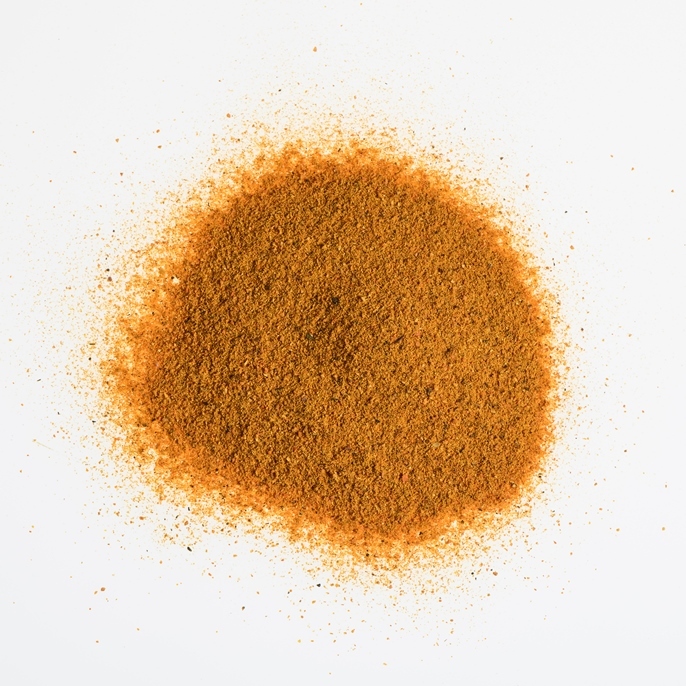 Oil of the fruits of Capsicum annuum, obtained by extraction with a solvent. 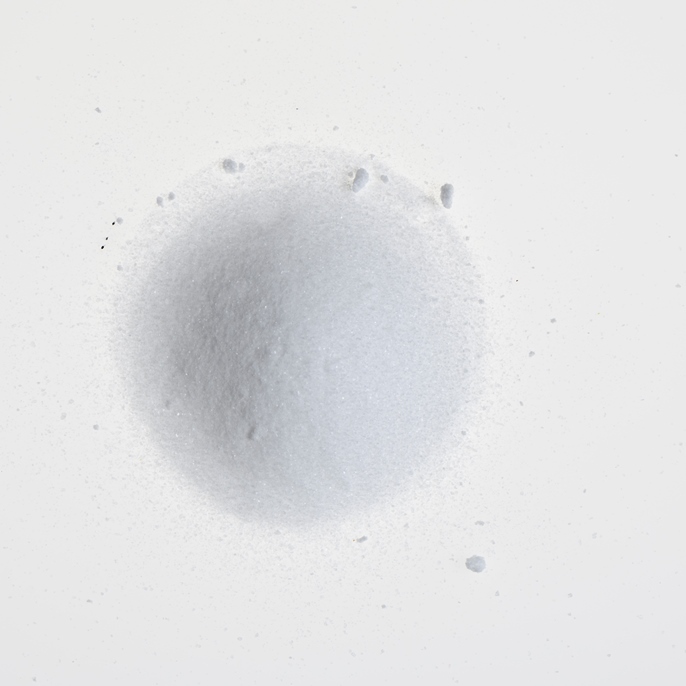 Water soluble: contains Polysorbate 80 (E-433). Colour between 5 000-50 000 u.c. Oilsoluble: colour between 10 000-100 000 u.c. 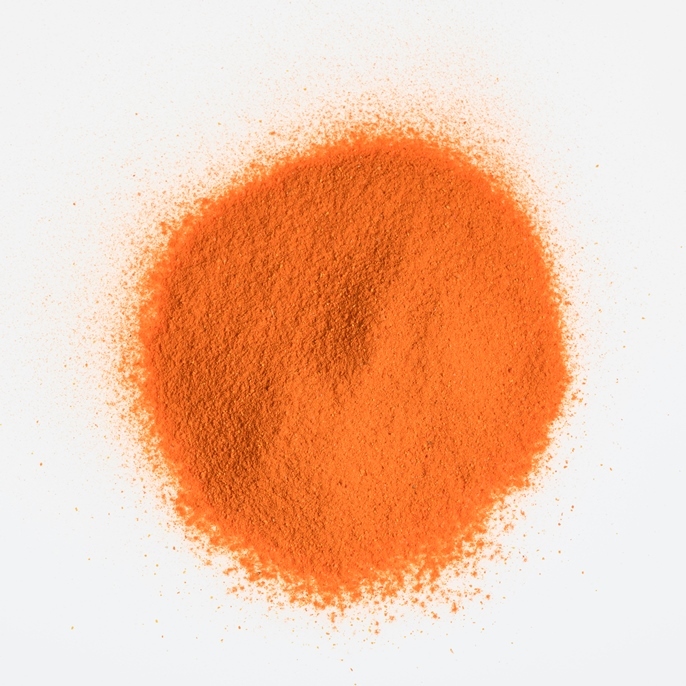 Oil of the fruits of Capsicum frutescens, obtained by extraction with a solvent. 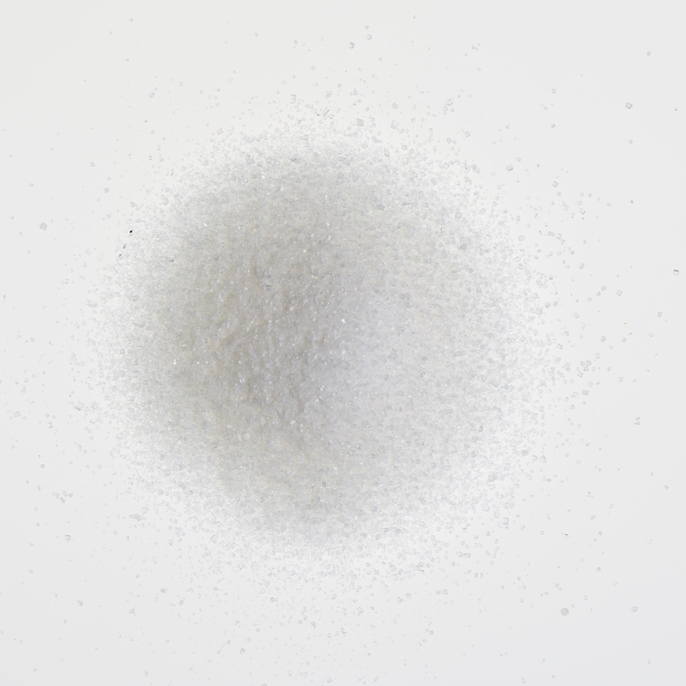 Water soluble: contains Polysorbate 80 (E-433). Spiciness between 50 000-500 000 shu. 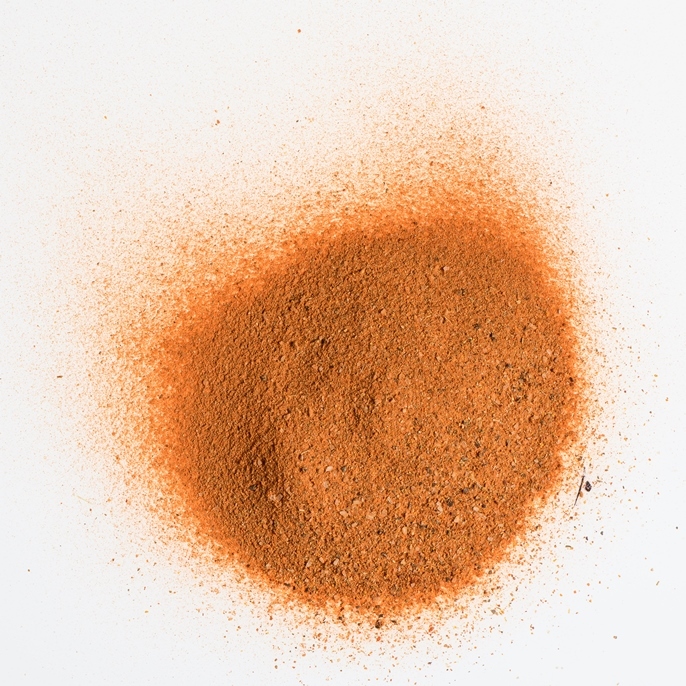 Oilsoluble: spiciness between 100 000-1 000 000 shu. Clean and dry fruits of Capsicum frutescens. Variable size between 3 and 5 cms. Intense and strongly spicy flavour. It might cause sneezing by bringing it closer to the nose. 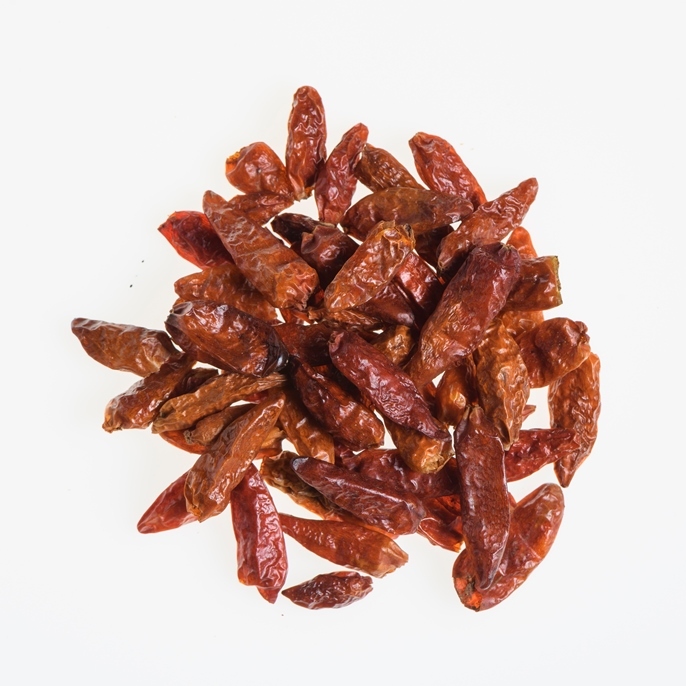 Clean and dry fruits of Capsicum frutescens, extremely spicy. Variable size between 1.5 and 2.5 cm. Intense and very spicy flavour. It causes sneezing by bringing it closer to the nose. 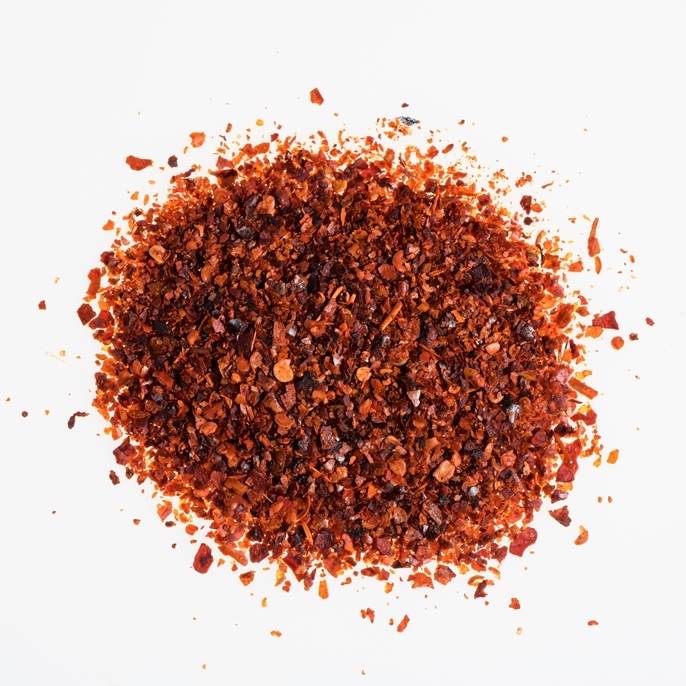 Mix of crushed pepper with red and green dehydrated peppers in flakes. 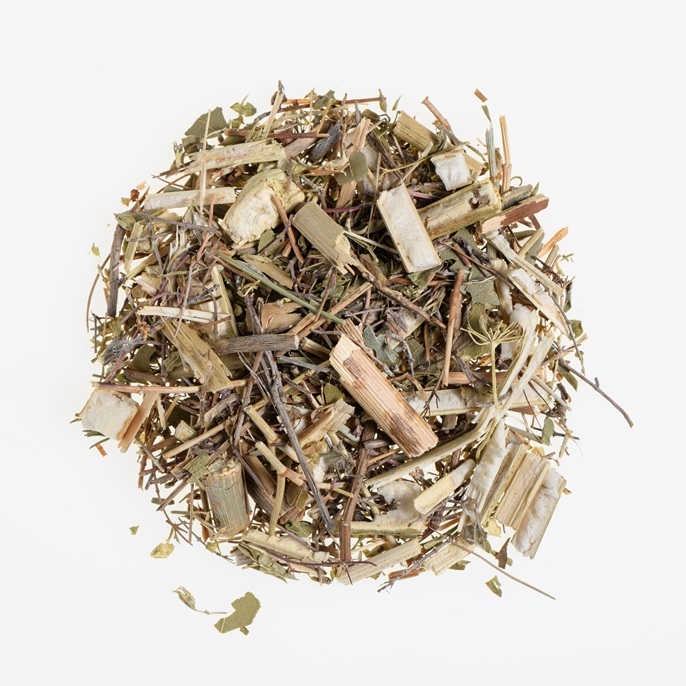 Very aromatic product with a great aesthetic presence. 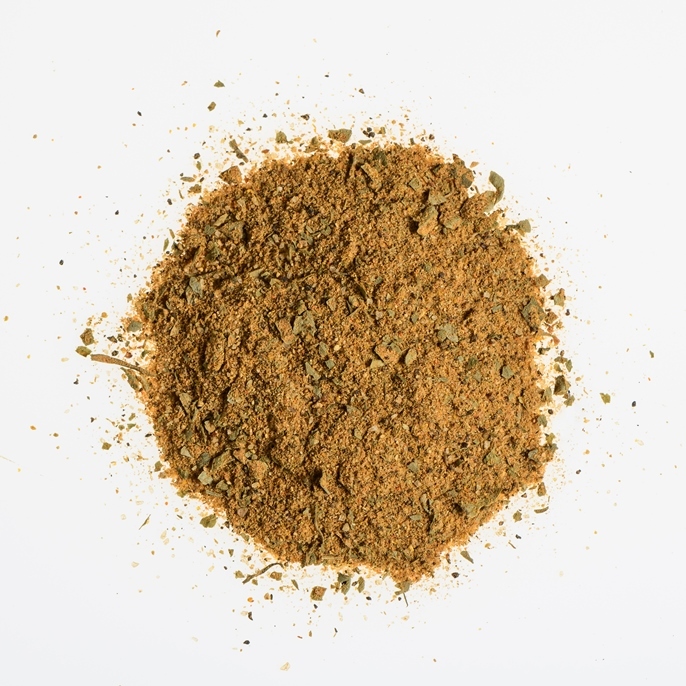 Mix of 7 spices used in Arabic cuisine. 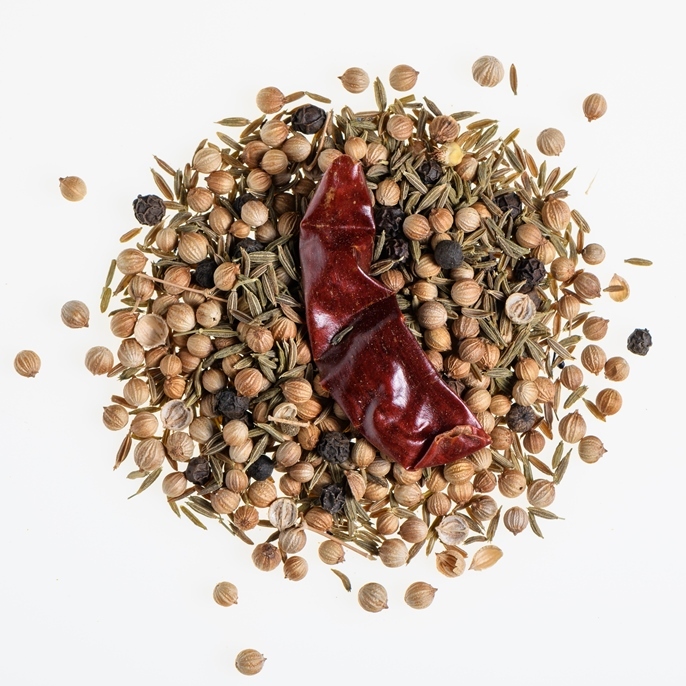 Italian style mix of spices. Mix of spices to season the olives. 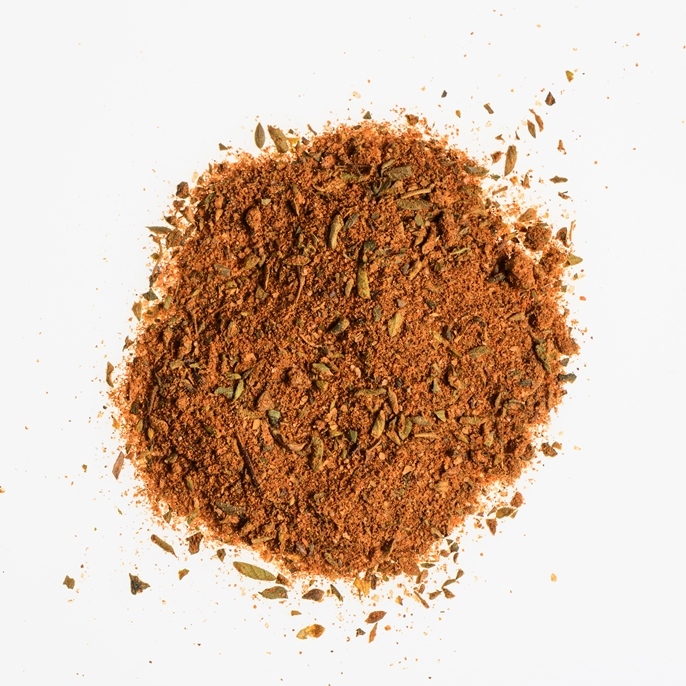 Mix of spices to prepare a rice dish from Pakistani, Indian or Turkish cuisine. 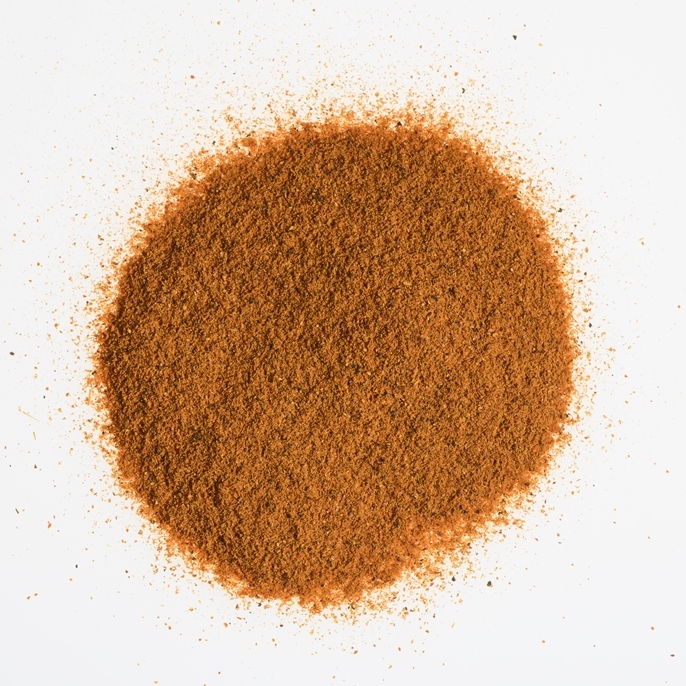 Mix of five spices very popular in Chinese cuisine. 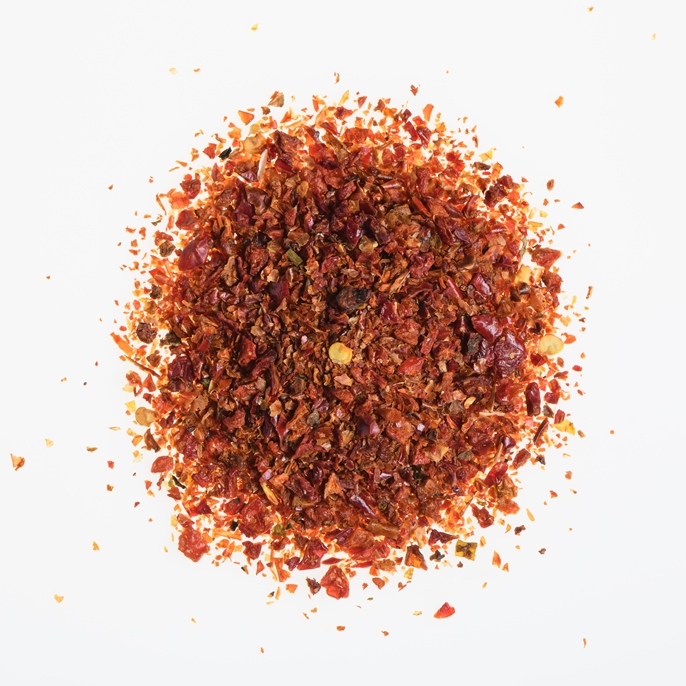 Mix of five different peppers. 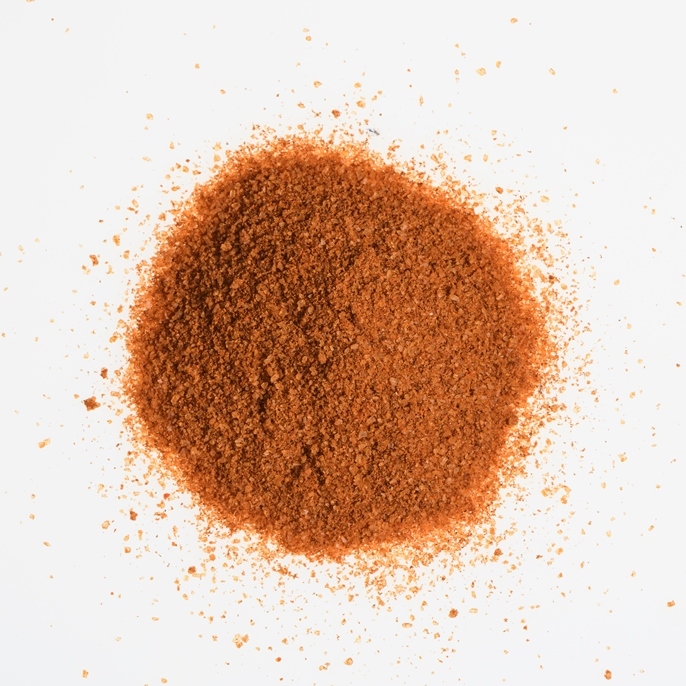 Typical mix of spices with cayenne. 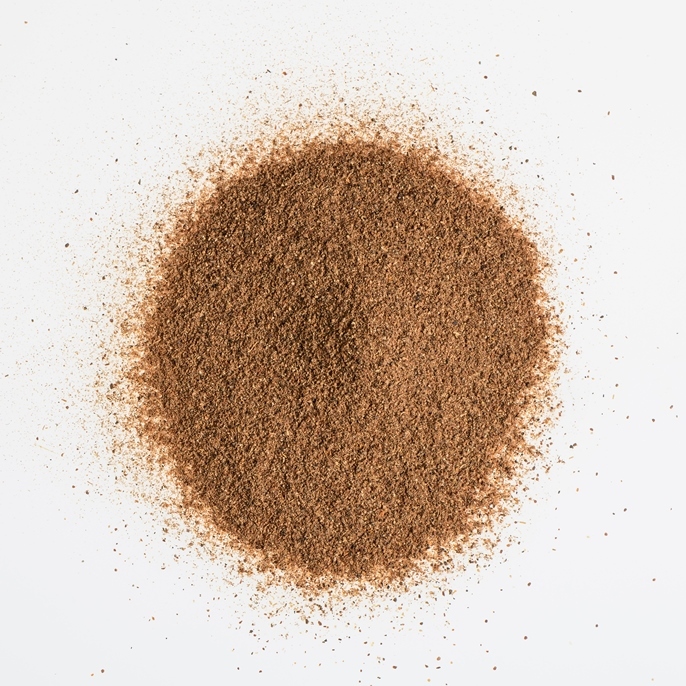 It contains also cumin, oregano and garlic, among others. 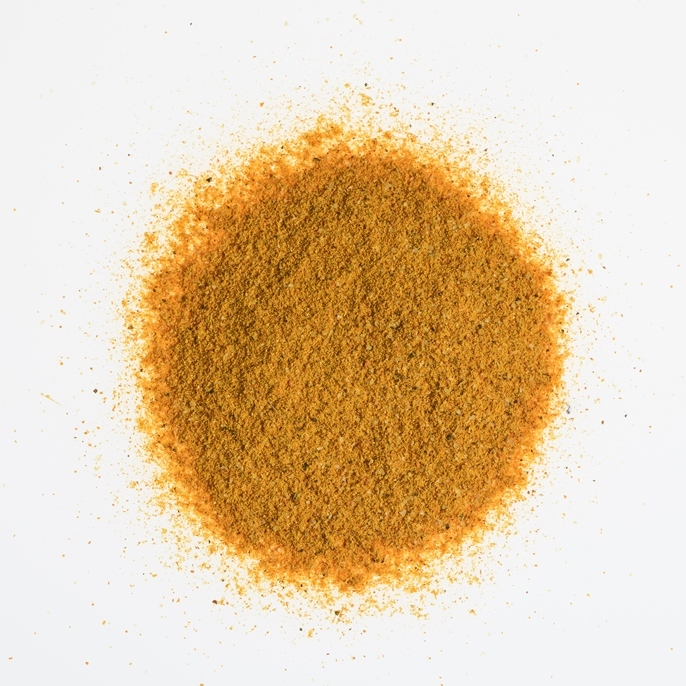 Typical blend of Indian spices, lighter in colour and smoother than the Indian Madras type. 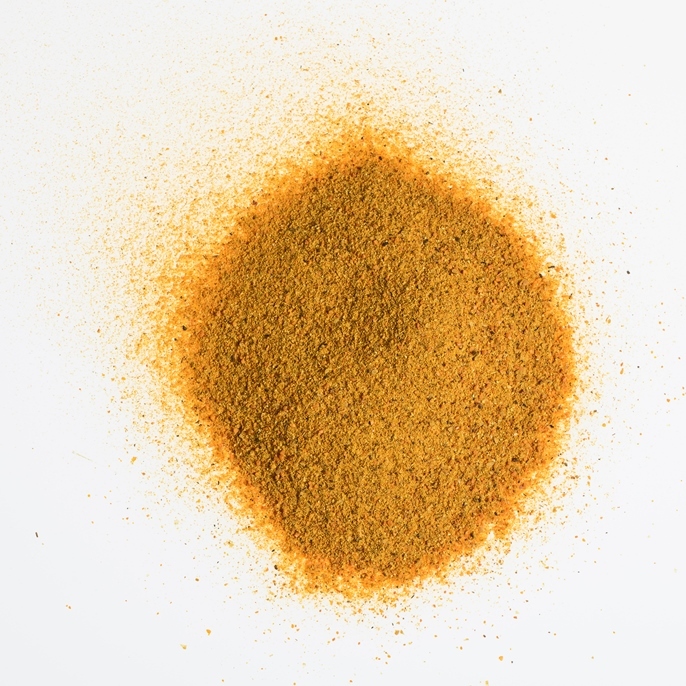 It combines with most dishes providing aroma and yellow colour. 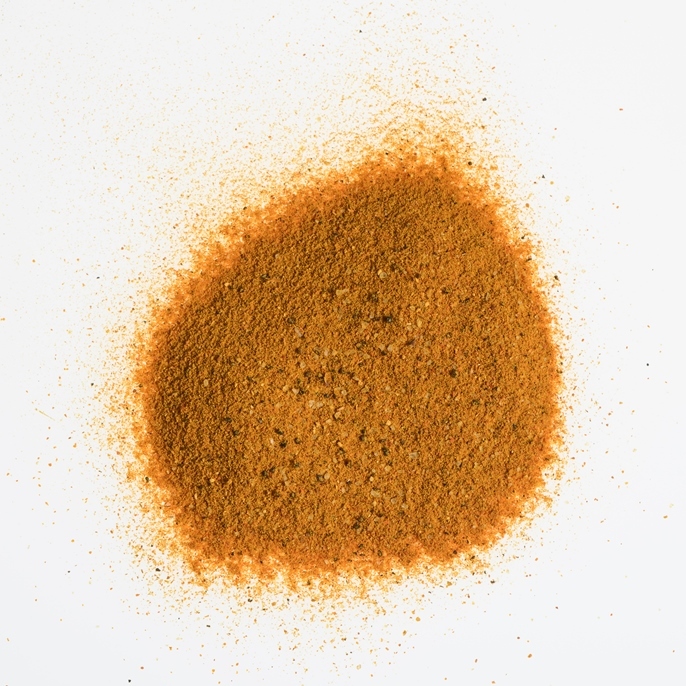 Typical blend of Indian spices with light colour and mild flavour. 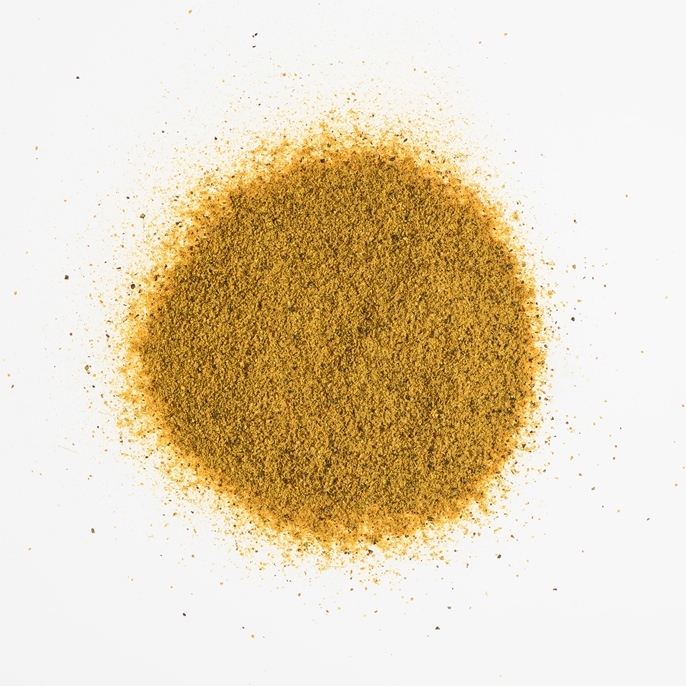 It combines with most dishes providing aroma and yellow colour. Typical blend of Indian spices with light colour and spicy flavour. 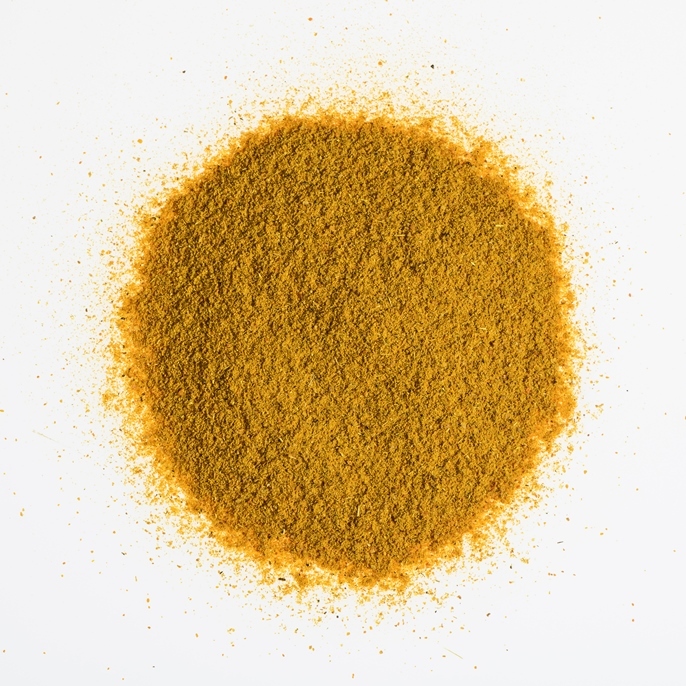 It combines with most dishes providing aroma and yellow colour. 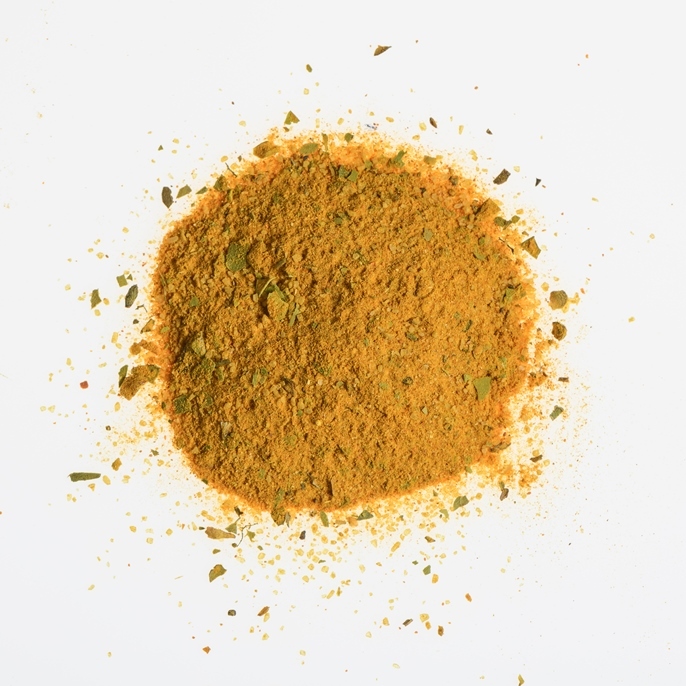 Typical blend of Indian spices of spicy flavour. It combines with most dishes. 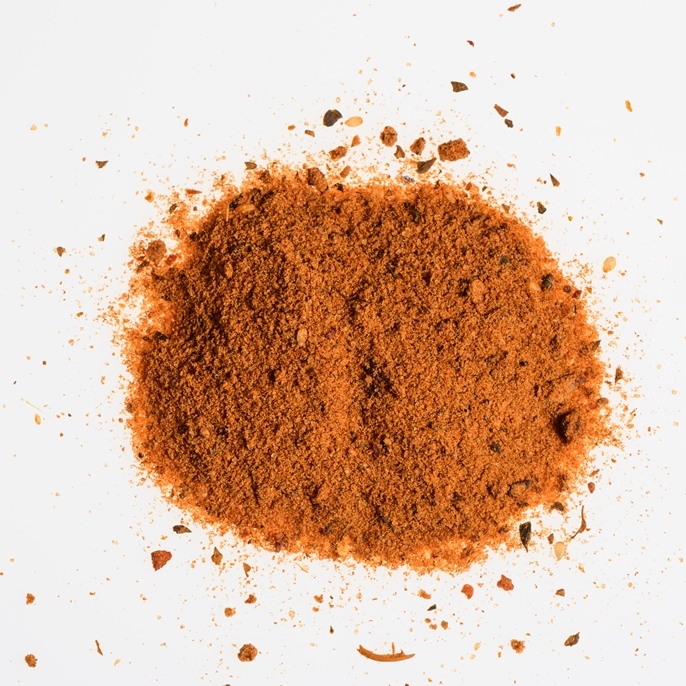 Typical blend of Indian spices. 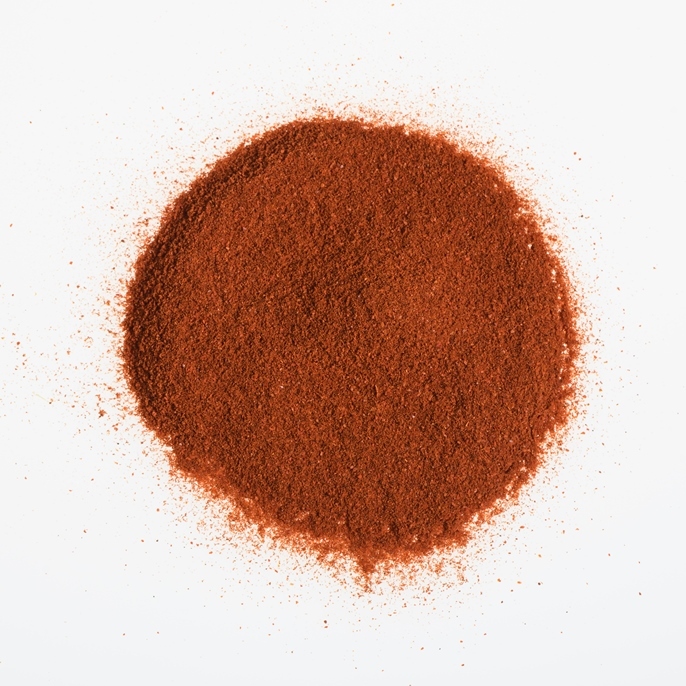 Typical blend of Indian spices of dark colour and very intense flavour. 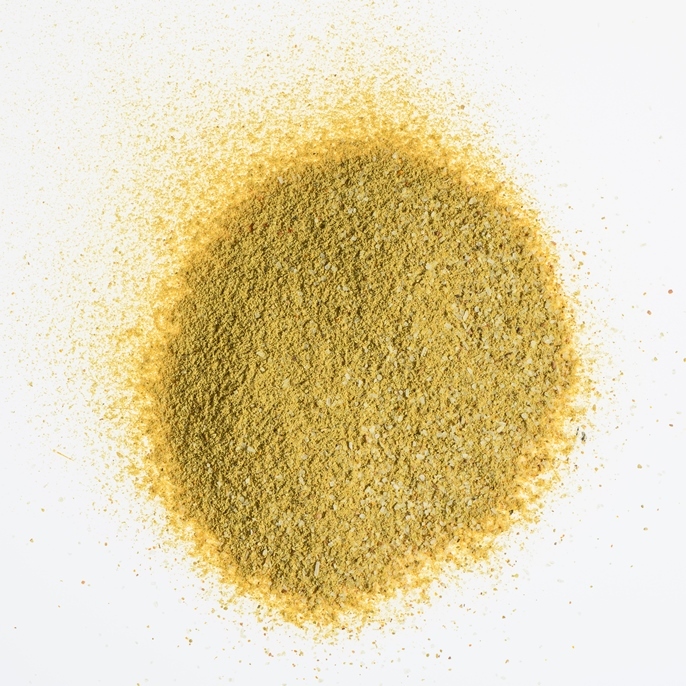 It combines with most dishes providing aroma and yellow color. 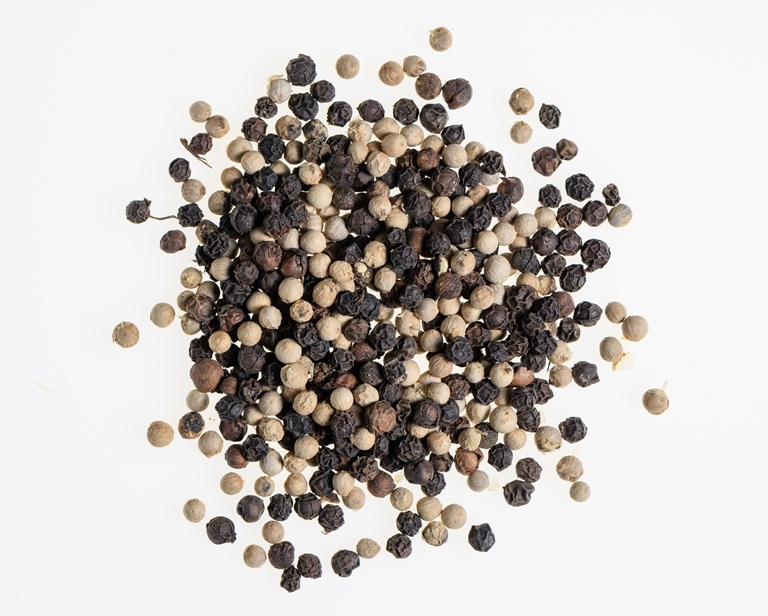 Mix of white and black pepper. 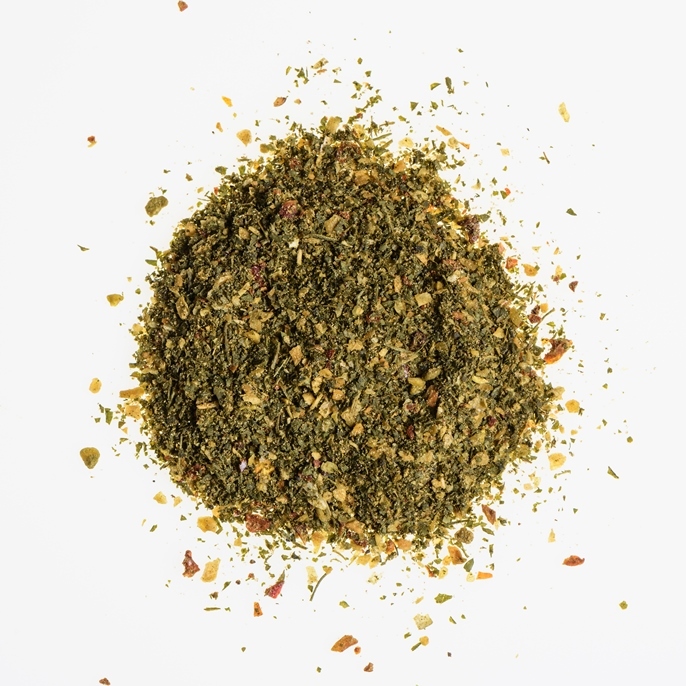 Typical Argentine mix of herbs and spices to enhance the flavour of rump steak. 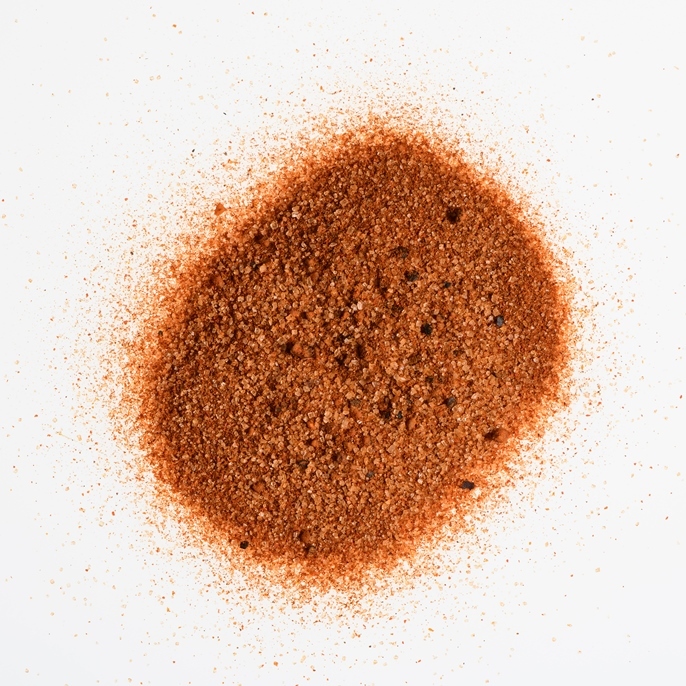 The spices are crushed. It does not contain salt. Mix of spices to prepare falafel, a croquette of chickpeas or beans from India, Pakistan and the Middle East. 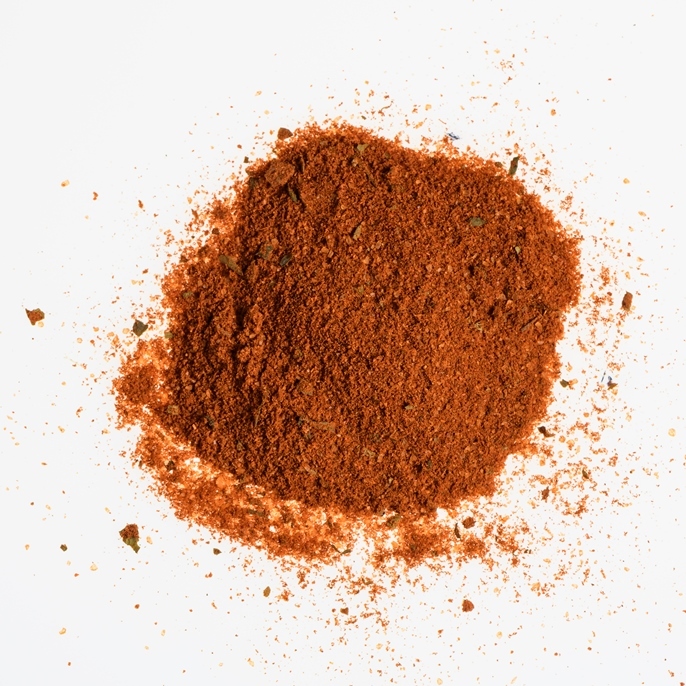 Mix of spices to prepare an omelet in the French style (omelette). 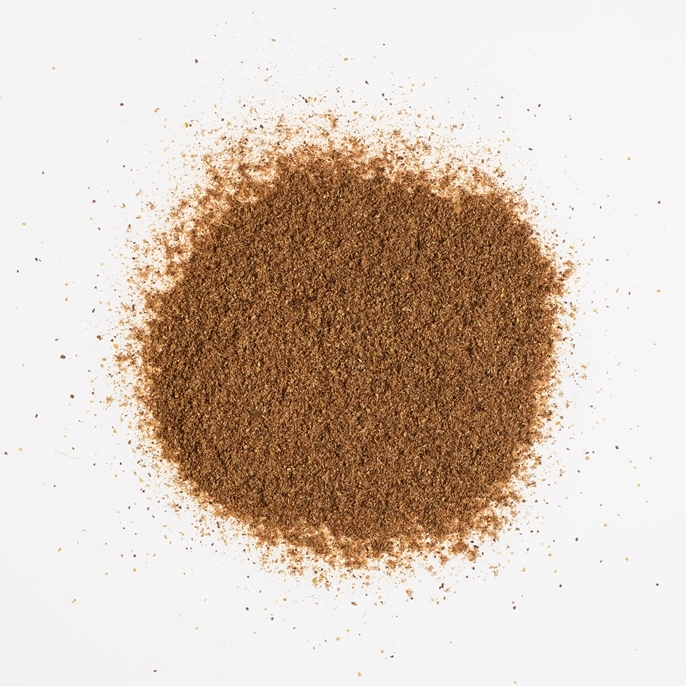 Exquisite mixture of spices to prepare snails and similar dishes. 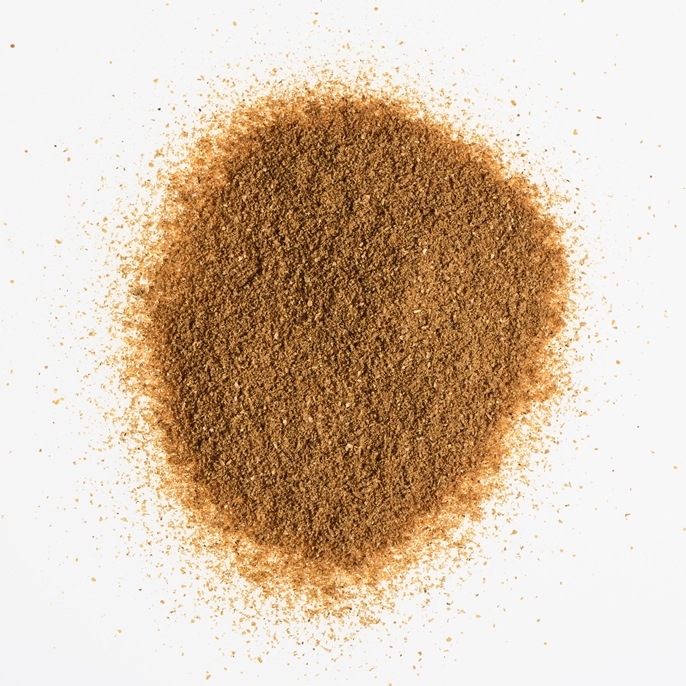 It is presented with whole spices (without crushing). It does not contain salt. 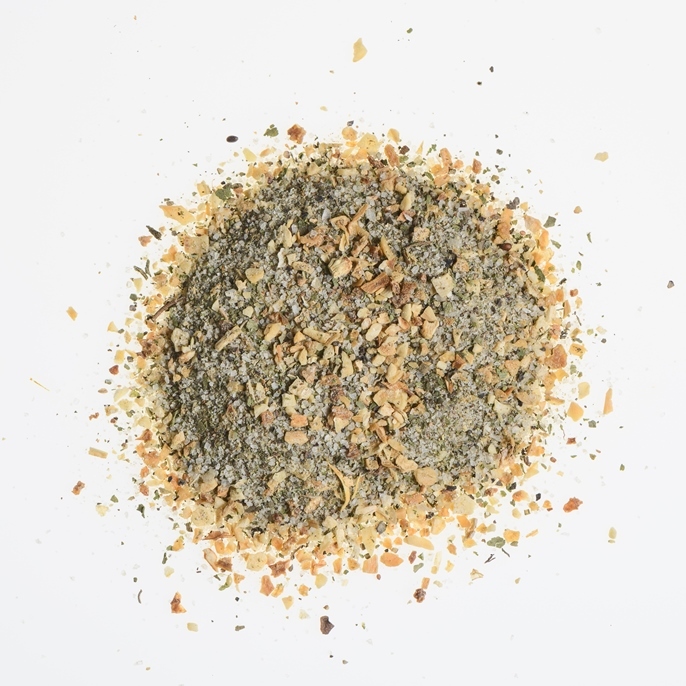 Blend of herbs and granulated spices. 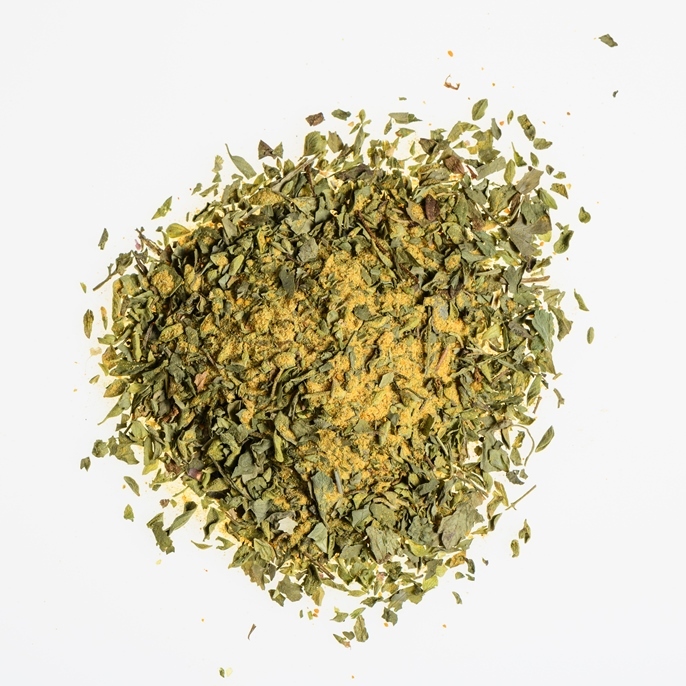 The dosage is ideal to achieve the mixture of colours and flavours. It does not contain salt. 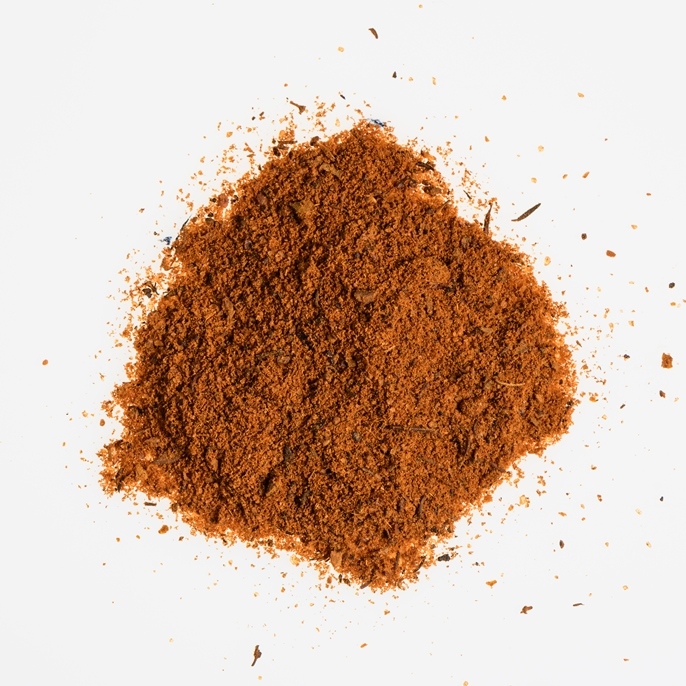 Mix of spices of spicy flavour for the preparation of skewers and meat in general. 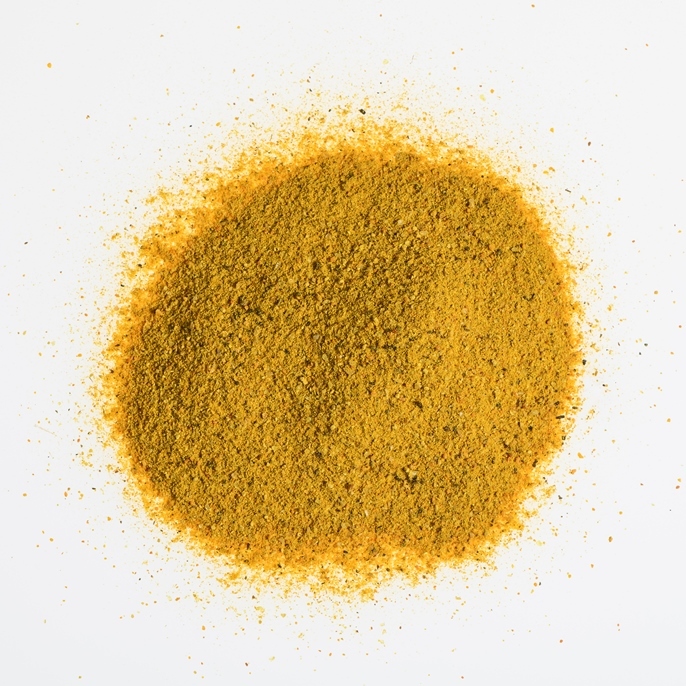 Yellow colour (turmeric base). 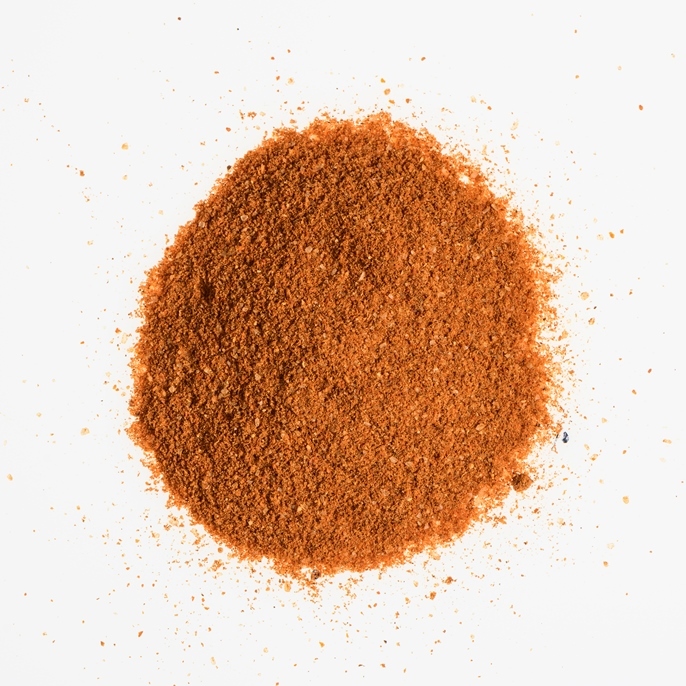 Mix of spices to give flavour to all kinds of red meat and barbecue skewers. 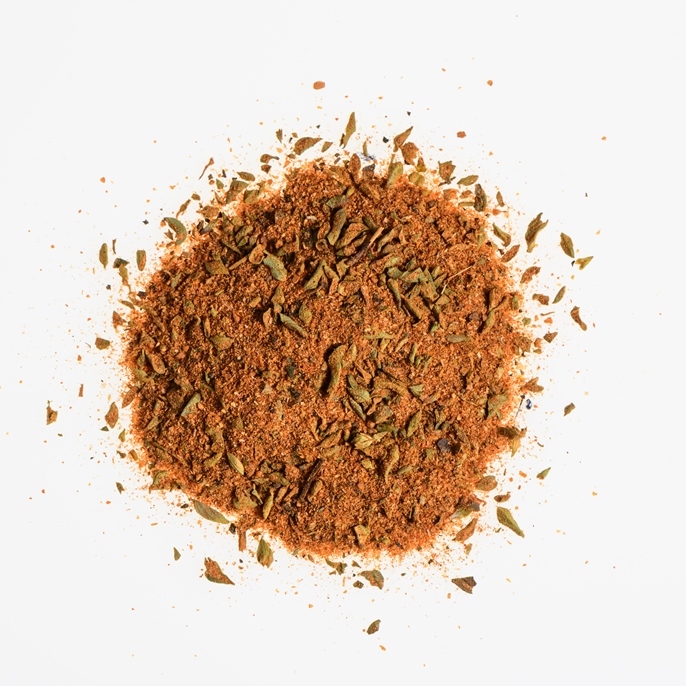 Typical for Indian cuisine spice mix. 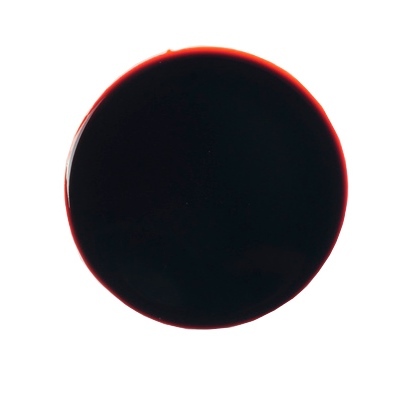 Dark colour and intense flavour. It combines with many kinds of dishes providing aroma and flavour. 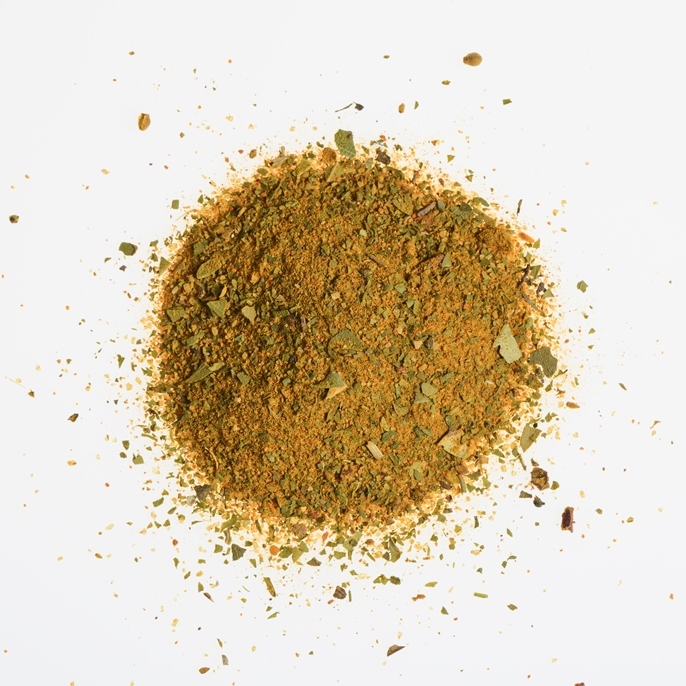 Mix of spices to flavour this traditional Moroccan soup. 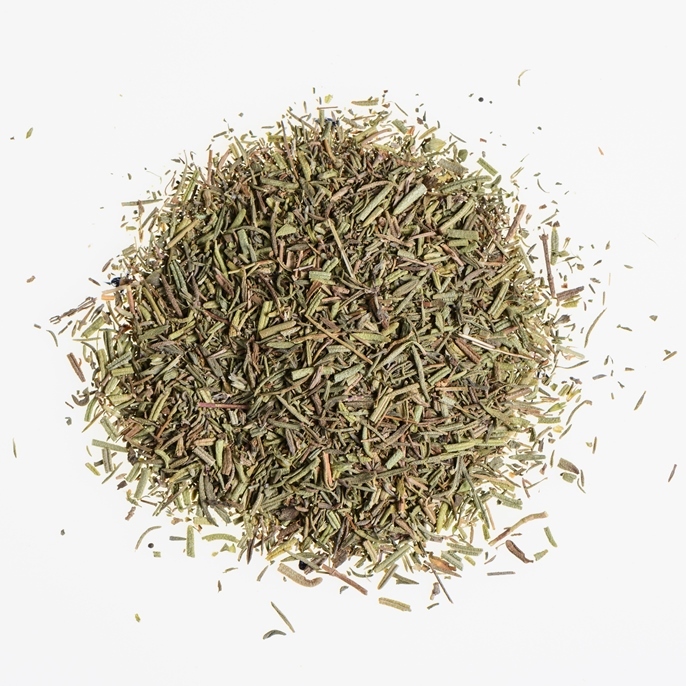 Popular in the Mediterranean regions mix of herbs. Used to enhance the taste of fishes and grilled meats. Mix of spices to prepare the dish called Kabsa – chicken with rice typical of Saudi Arabia. 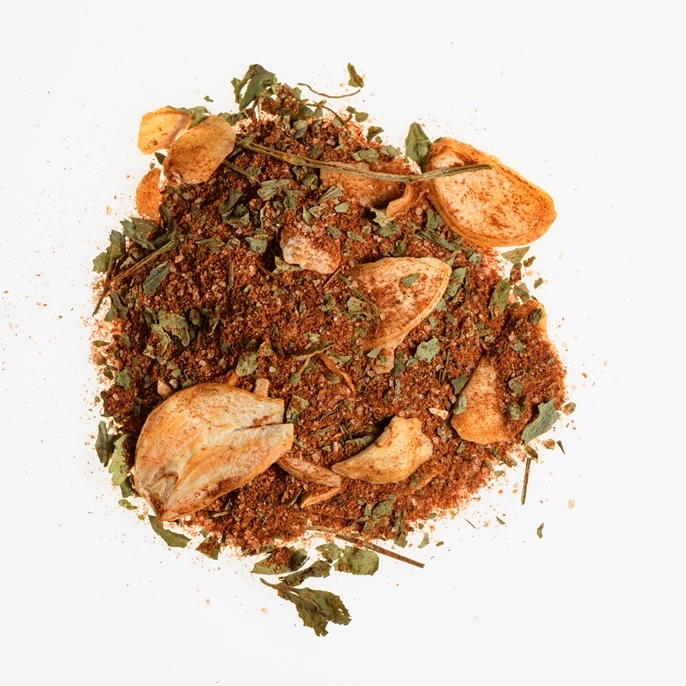 Mixture of spices to prepare barbecues with the Mexican flavour. 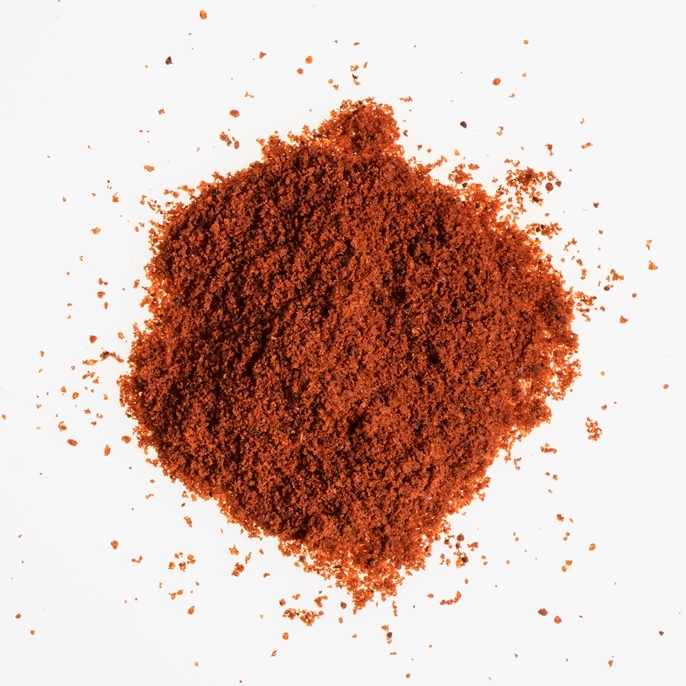 It contains sugar, salt and paprika. 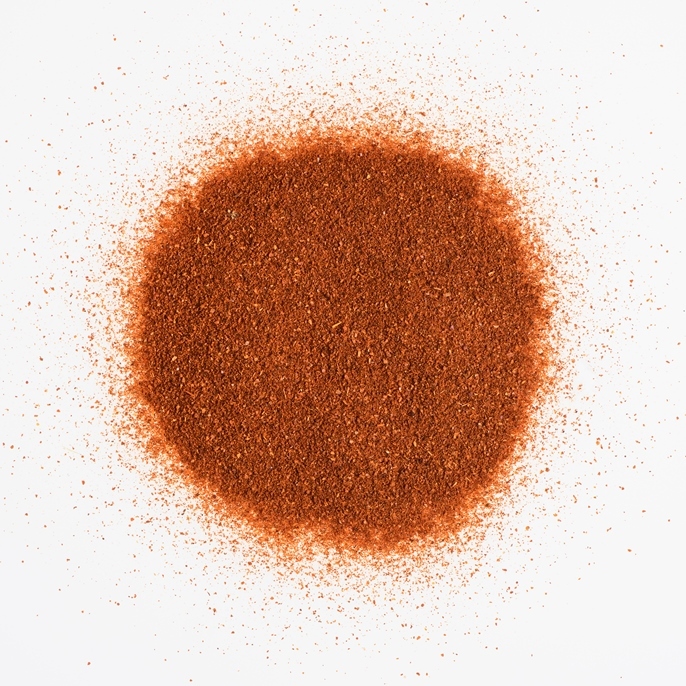 Mexican style spice blend. It contains sliced onion, red pepper and paprika powder. 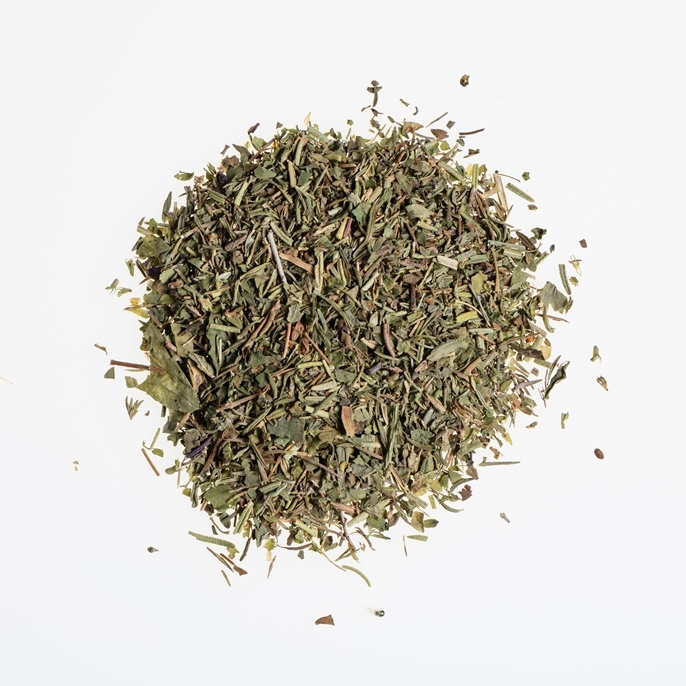 Mix of aromatic herbs and parsley. 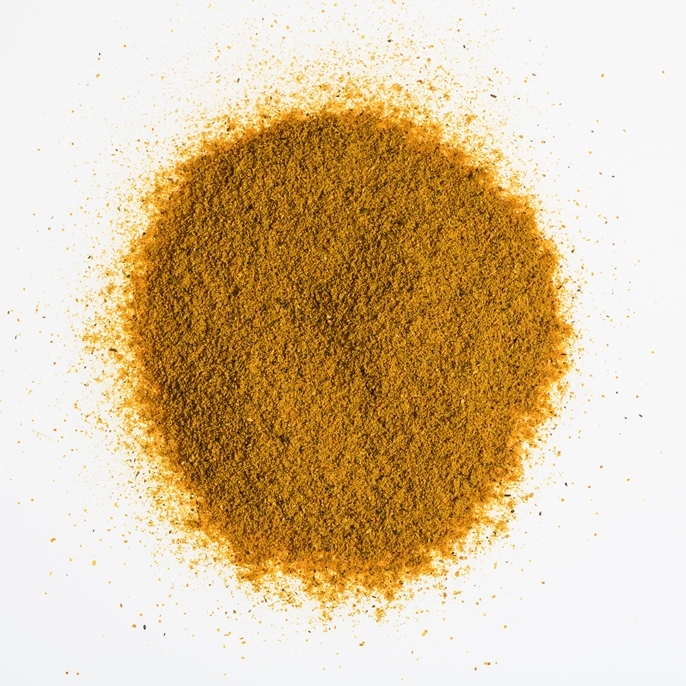 Mix of all the spices necessary to prepare this tasty dish of Canarian cuisine. Spicy. 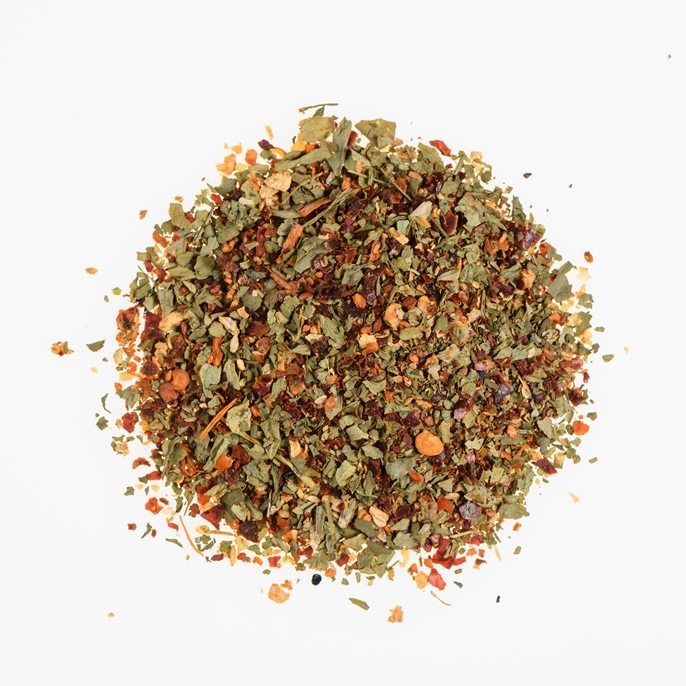 Neapolitan style mix of spices. 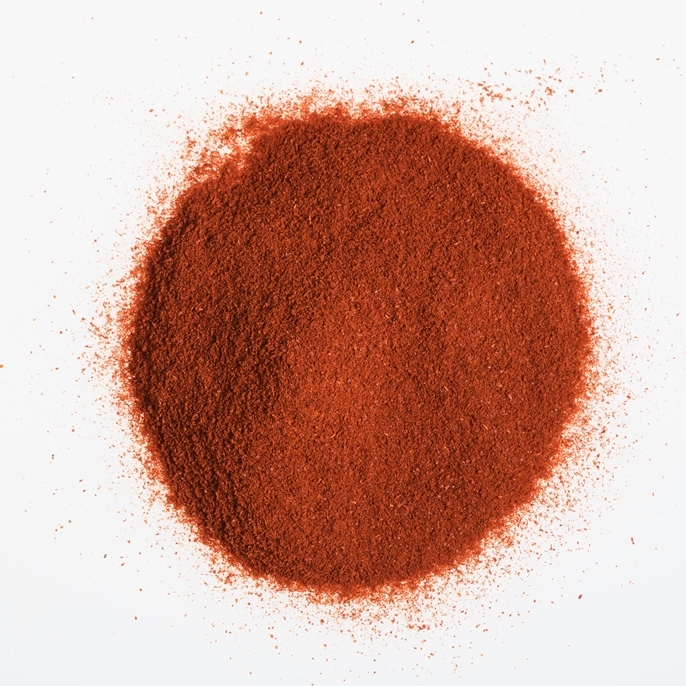 Contains sliced onion, red pepper and ground paprika. 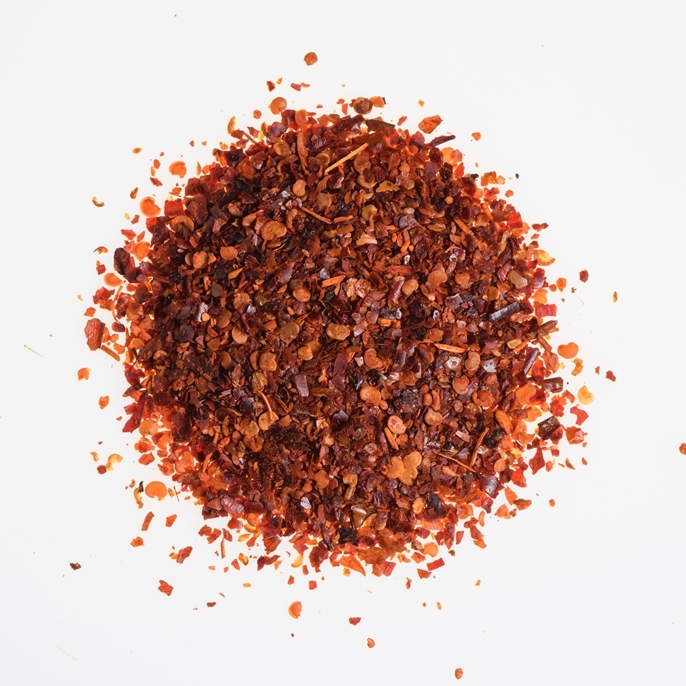 The ideal mix of spices to prepare very tasty paella. 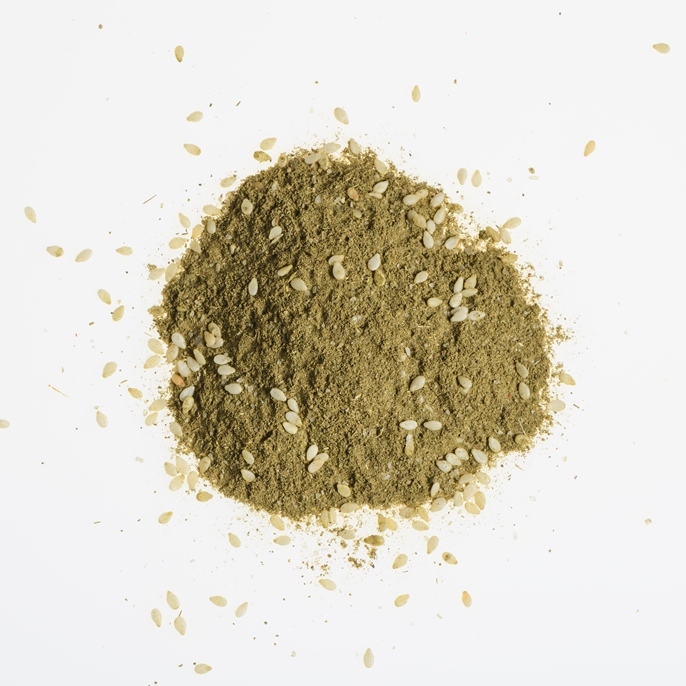 In addition to preparing paellas it is very useful in all kinds of rice dishes, as well as fish soups and broths. Contains saffron. 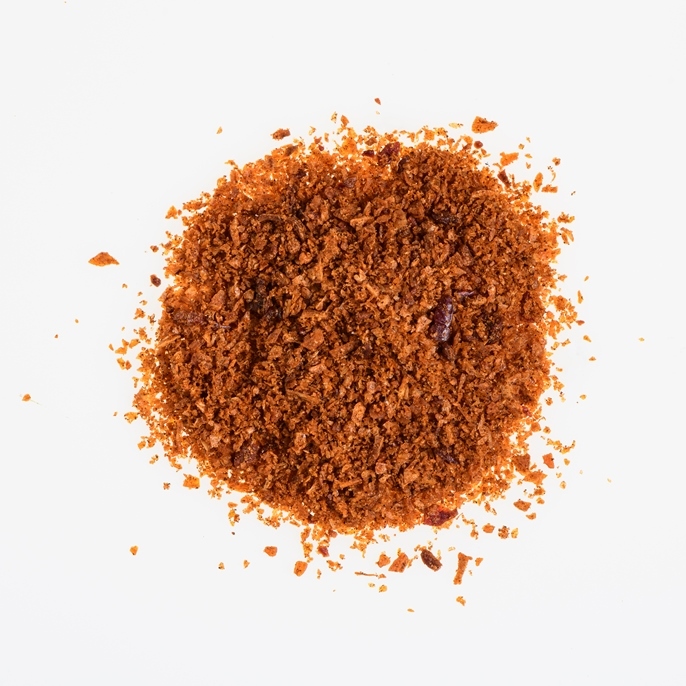 The ideal mix of spices to flavour paella. 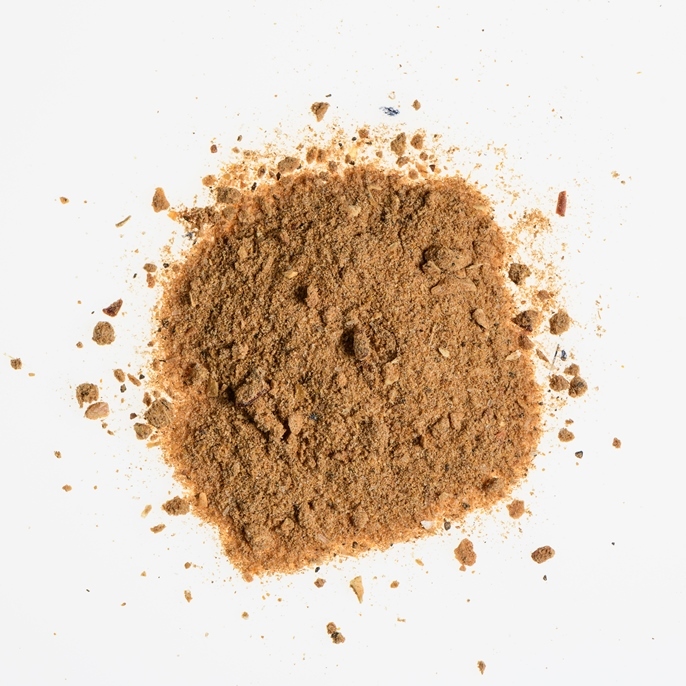 In addition to preparing paellas it is very useful in all kinds of rice dishes, as well as fish soups and broths. 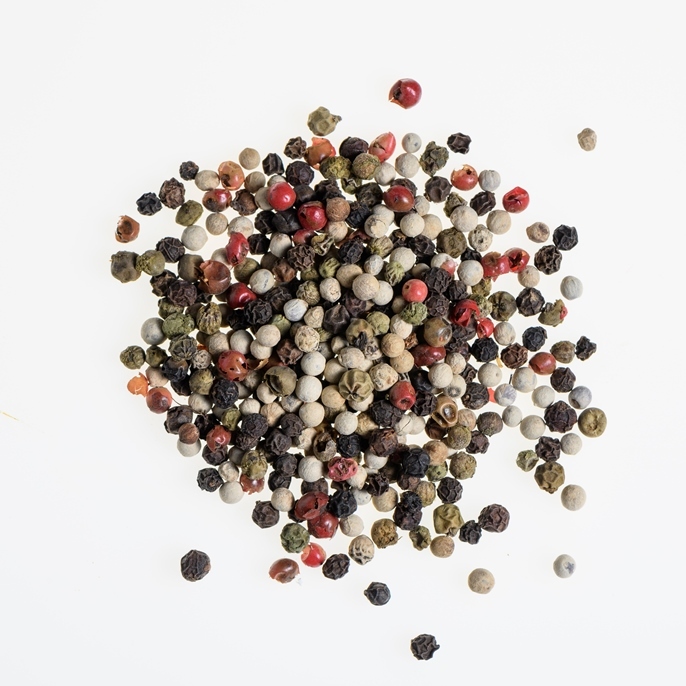 Mix of four types of peppers to obtain a very aromatic product with great aesthetic presence: white pepper, black pepper, green pepper and pink pepper. 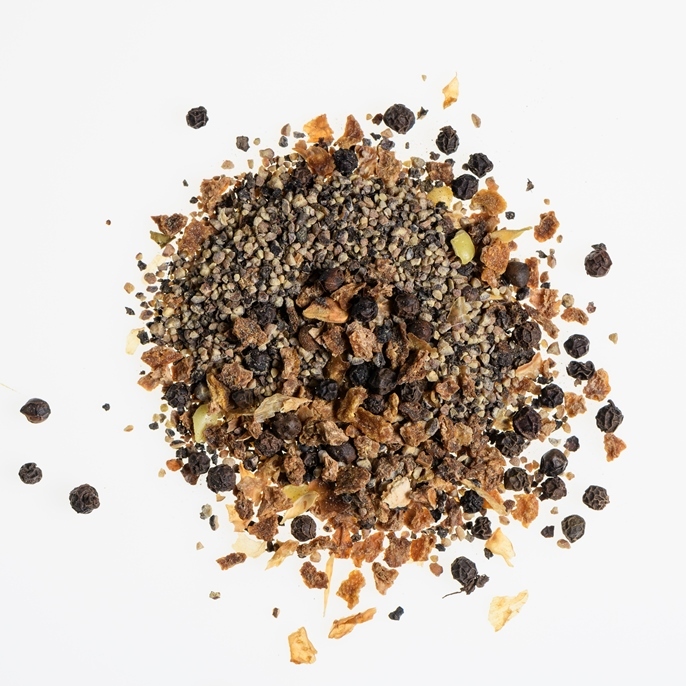 Mix of crushed black peppercorns with dehydrated lemon. Designed especially for grinders where it develops its full aroma at the consumption time. 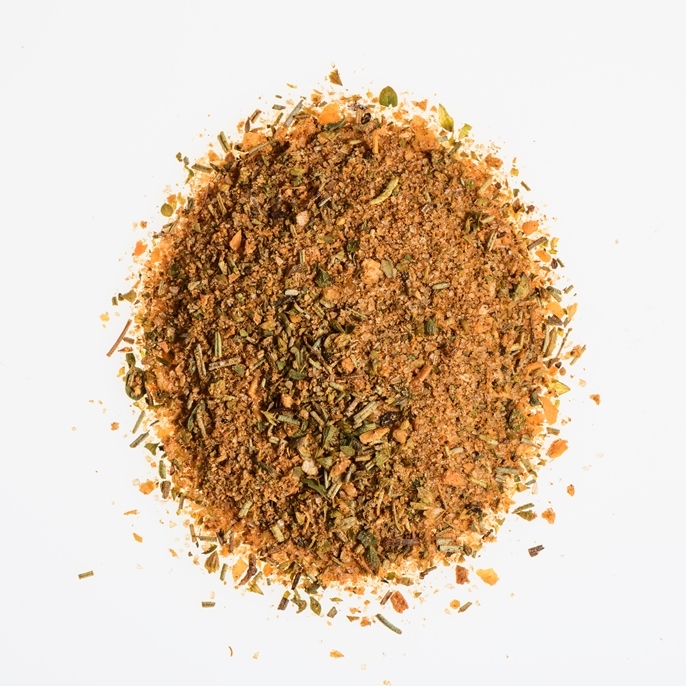 This spice mix is a classic Middle Eastern seasoning used in many meat dishes. 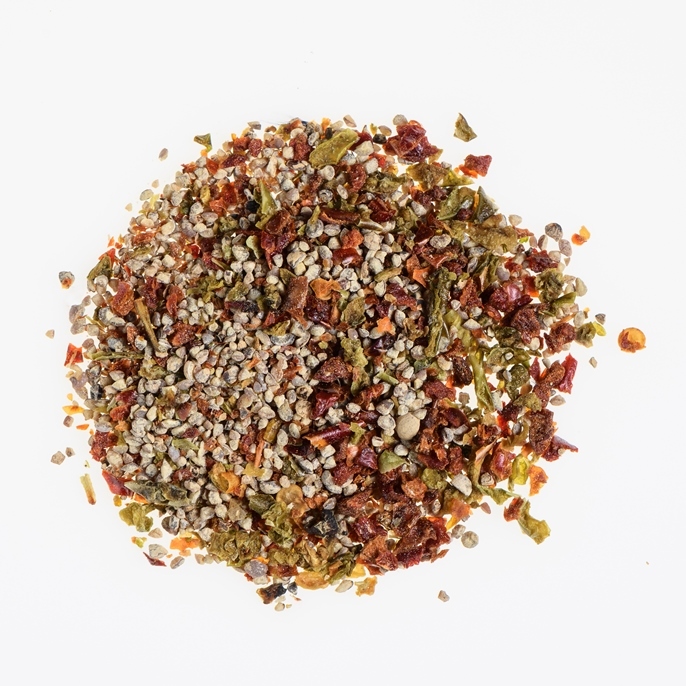 Provencal style mix of spices. 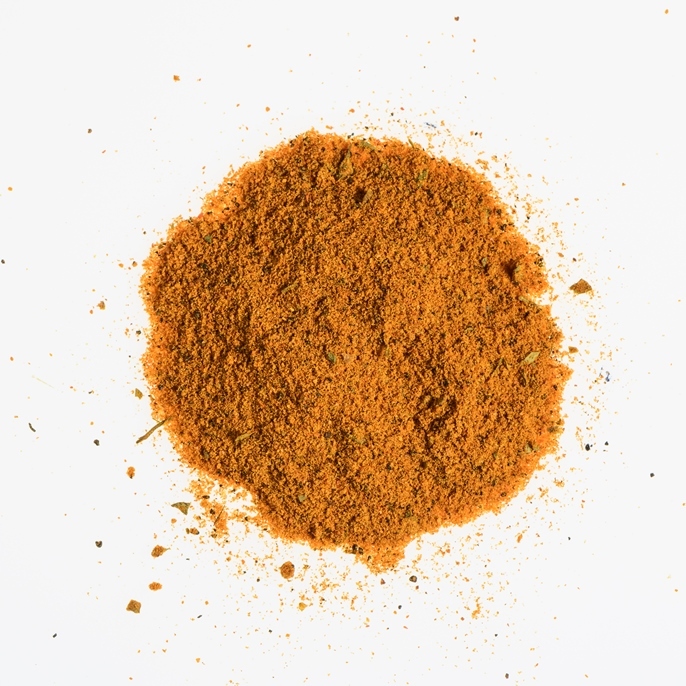 Contains onion, red pepper flakes and ground turmeric. 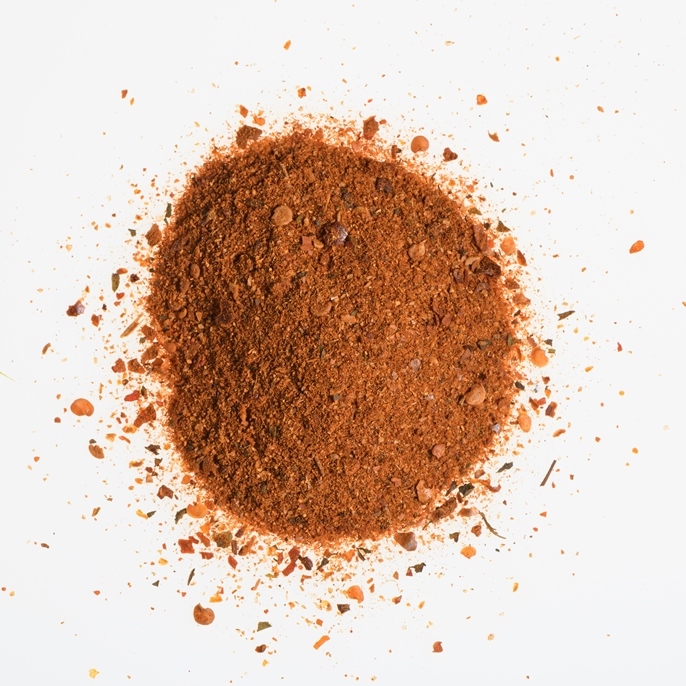 Mix of spices and additives to flavour and give colour to the typical Merguez, spicy red sausage from North Africa, made with lamb or beef. 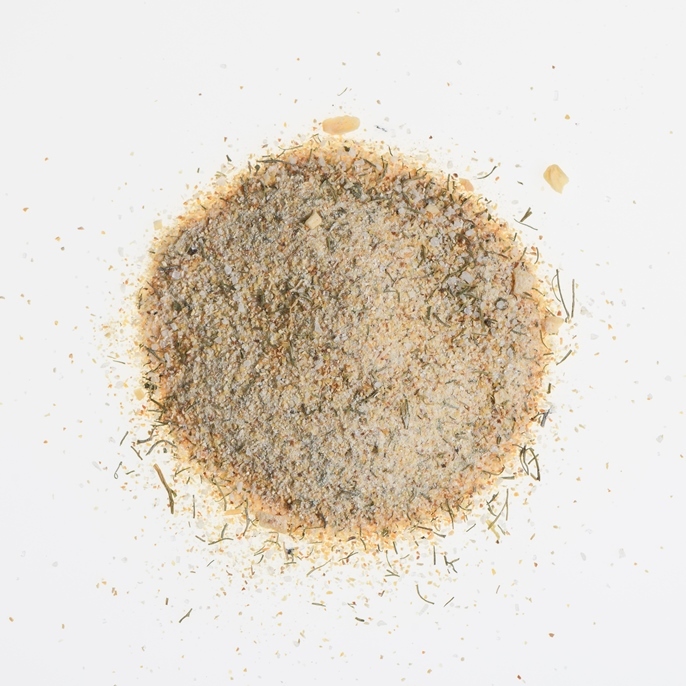 Mix of garlic powder with salt to facilitate its dosage and use. 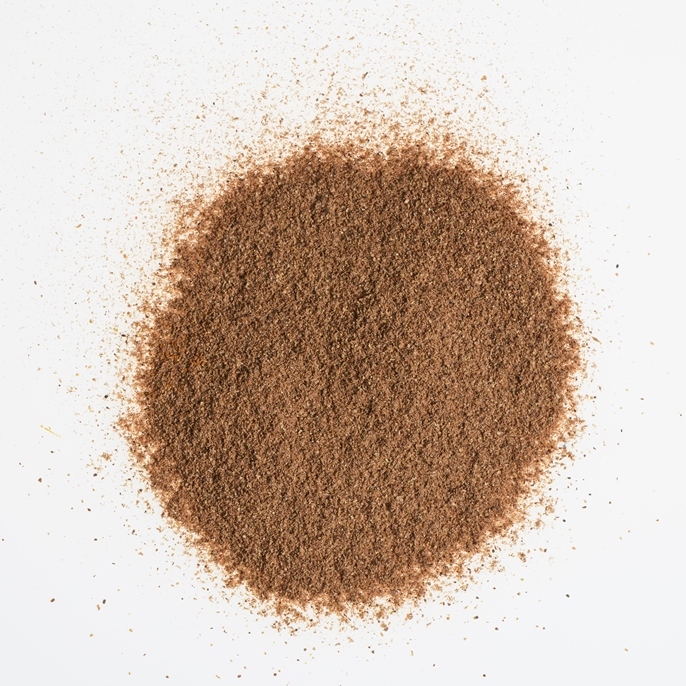 It has the same use as ground garlic. 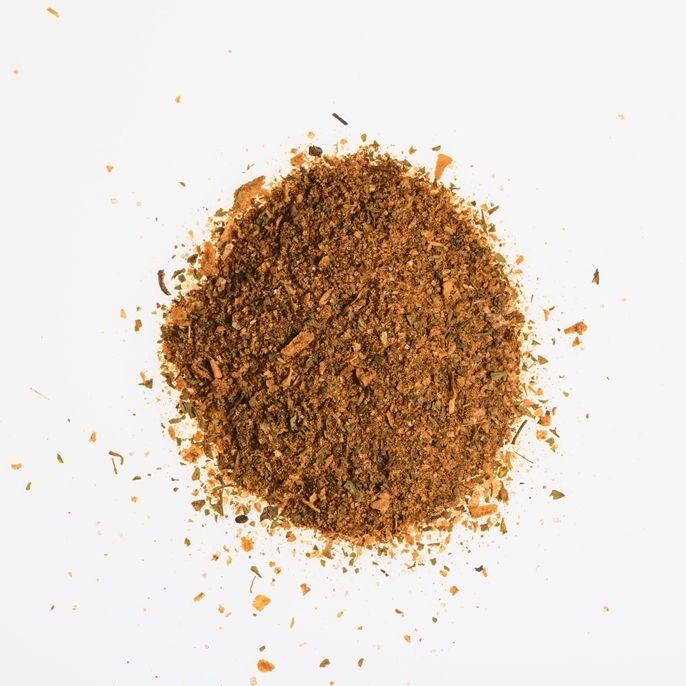 Blend of spices to flavour chips. 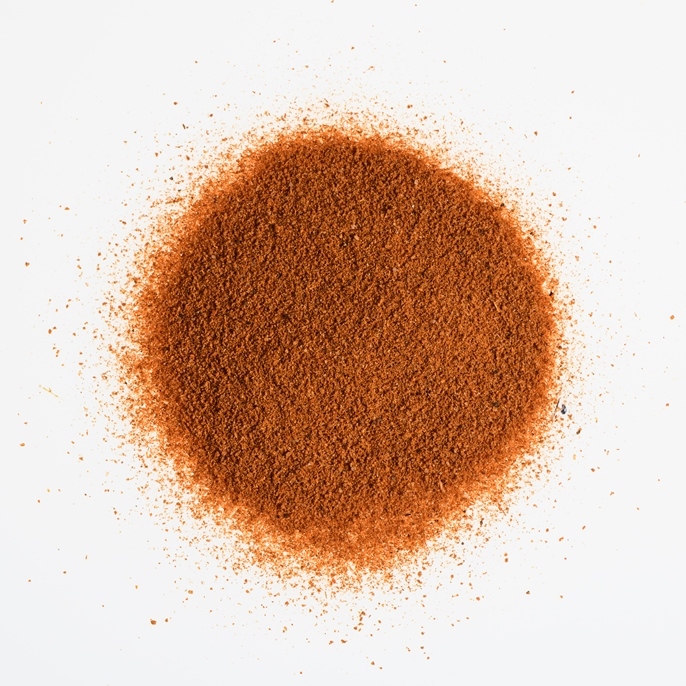 Exquisite mix of spices for stews, sauces and roasts with octopus. 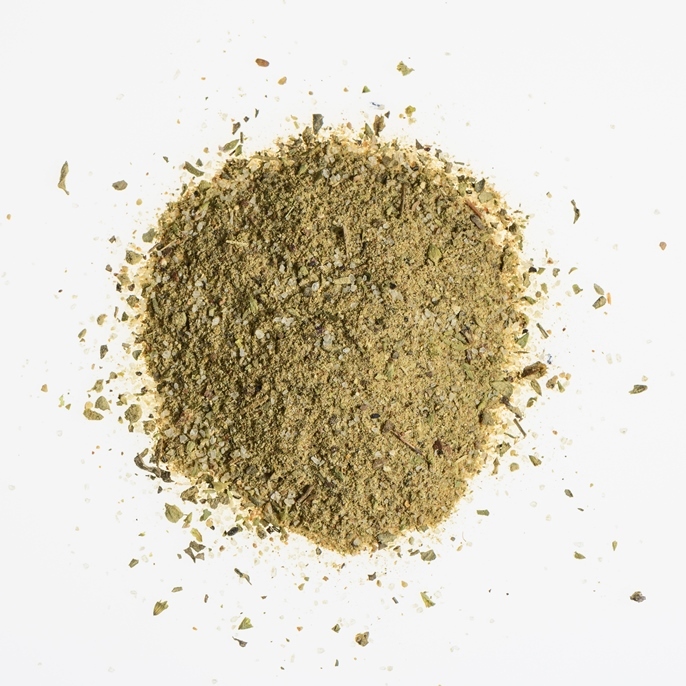 Mix of ground celery with salt to facilitate its dosage and use. 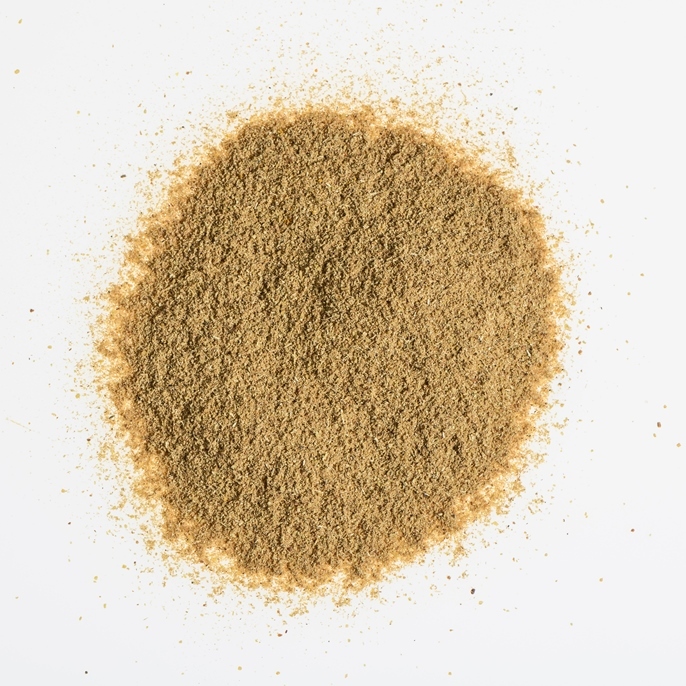 It has the same use as ground celery. 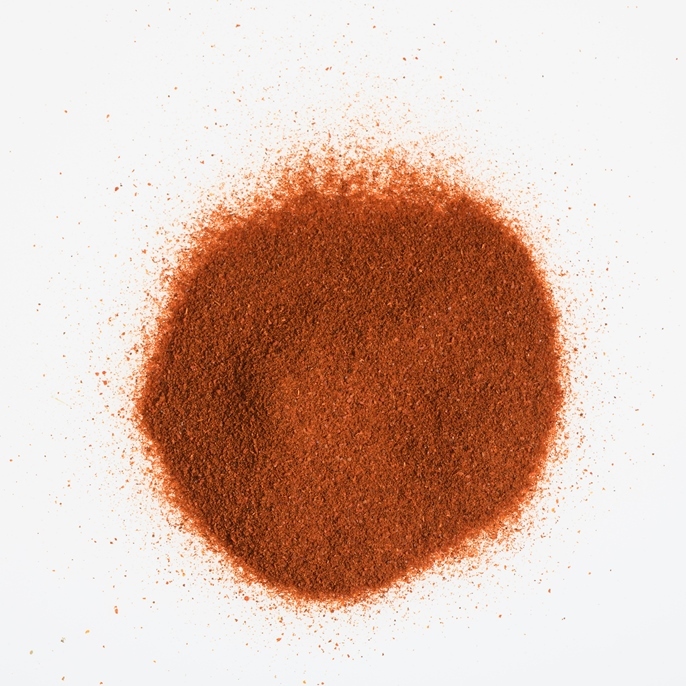 Mix of all necessary spices to give flavour to beef of this typical dish of Mexican cuisine. 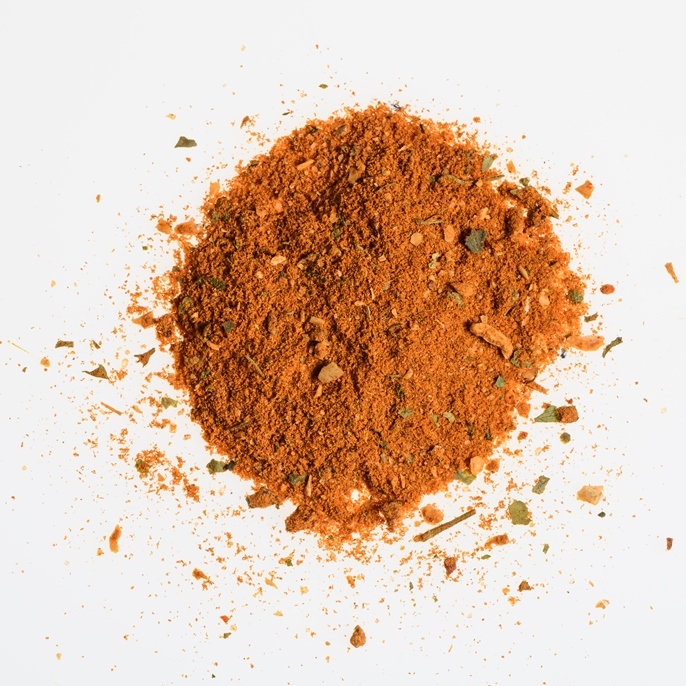 Mix of spices to add flavour of an authentic Cajun cuisine. Spicy. 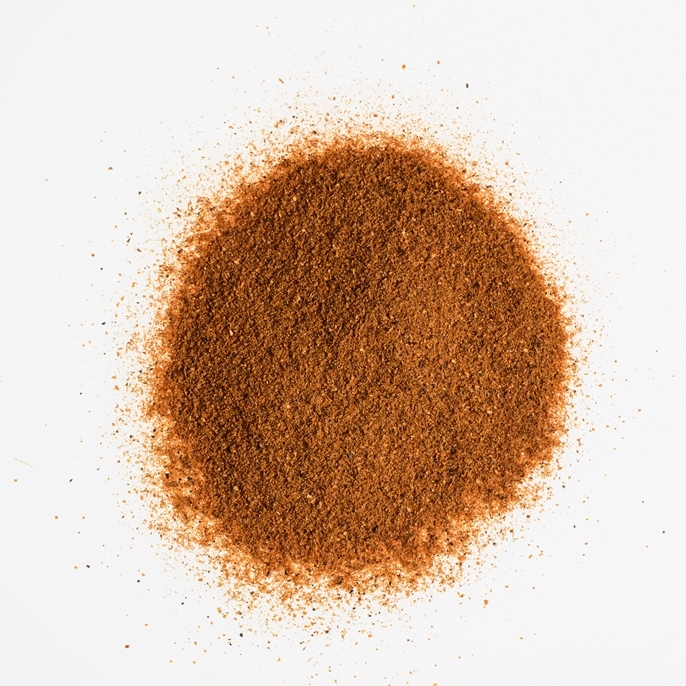 Exquisite mix of spices to prepare snails and similar dishes. 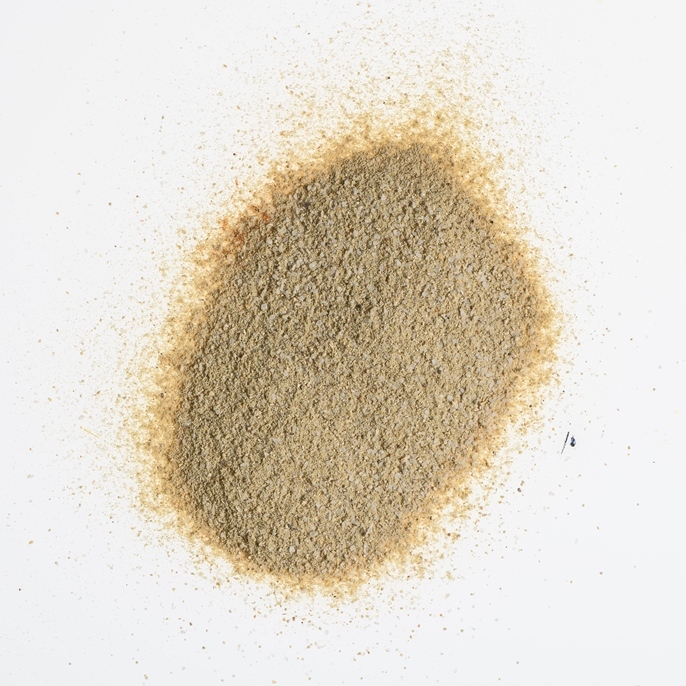 It has powder form and contains salt. 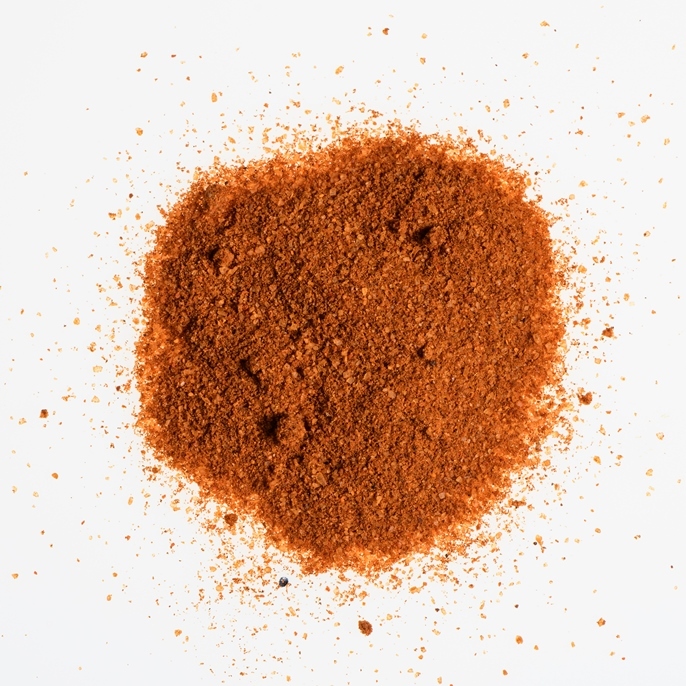 Mix of spices to prepare grilled meat. 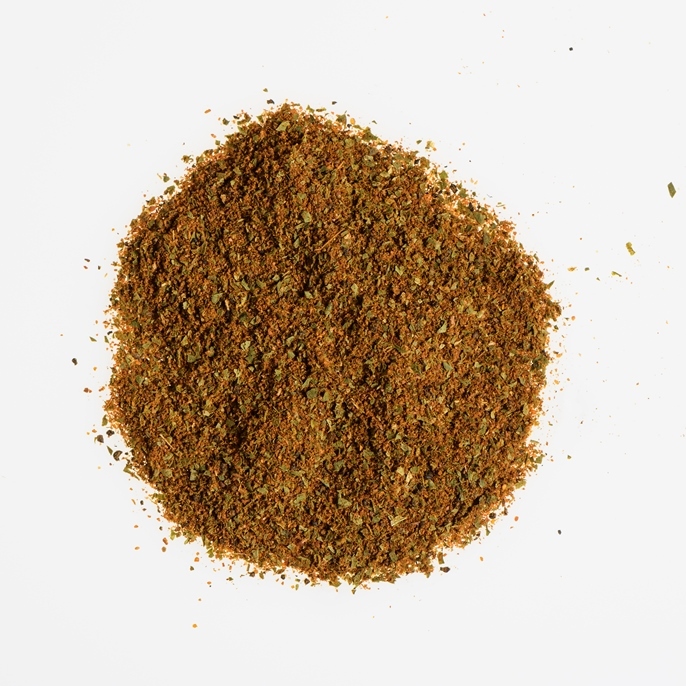 Mix of spices to give an Arab flavour to meat. 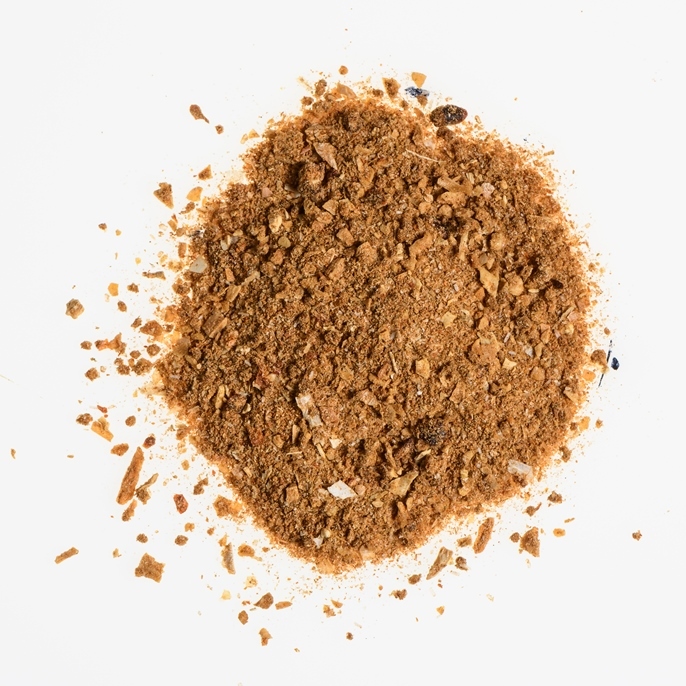 Mix of spices for barbecue. 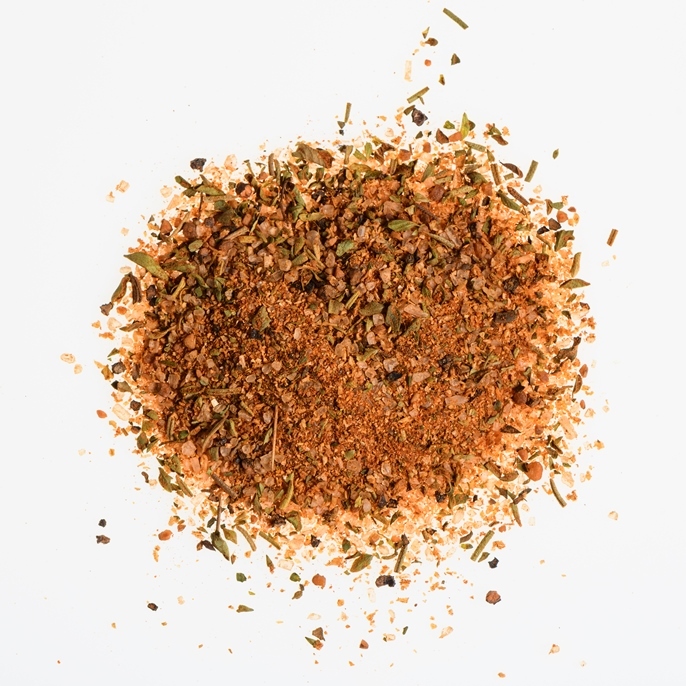 Mix of spices to season meat. Contains garlic. Traditional spice blend from French West Indies (Guadeloupe, Martinique, among others). 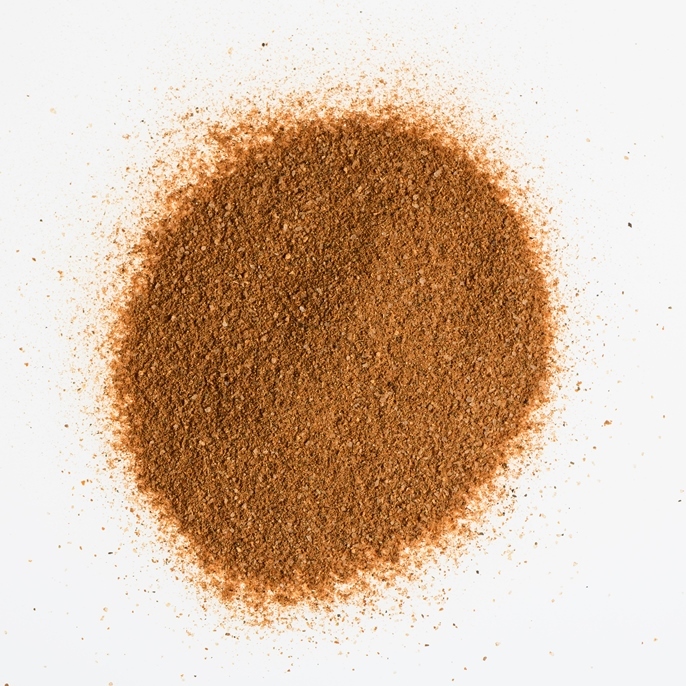 Also called poudre de Colombo or West Indian curry powder. 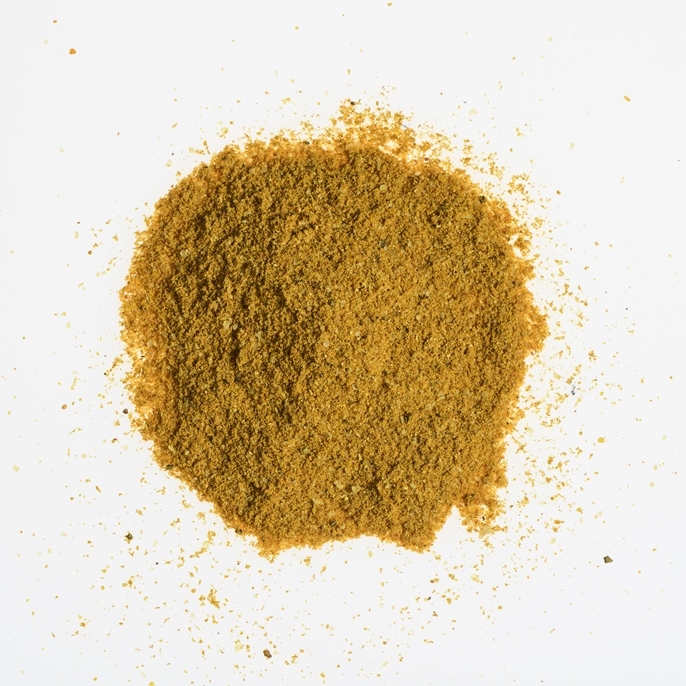 It can be used in all dishes you would use curry powder (meats, poultry, cooked vegetables). Mild flavour. 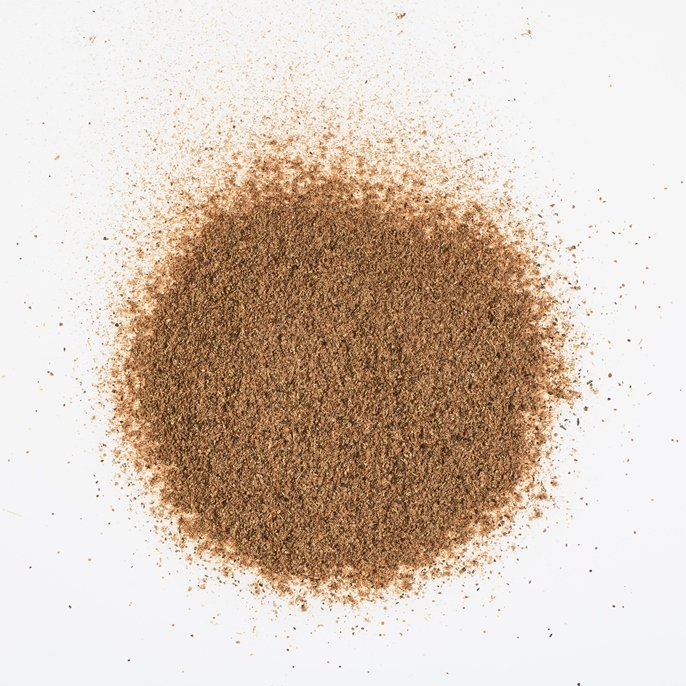 Blend of spices to add special flavour to lamb and other dishes with lamb as an ingredient. Mix of all essencial spices to flavour this typical dish of Mexican cuisine. 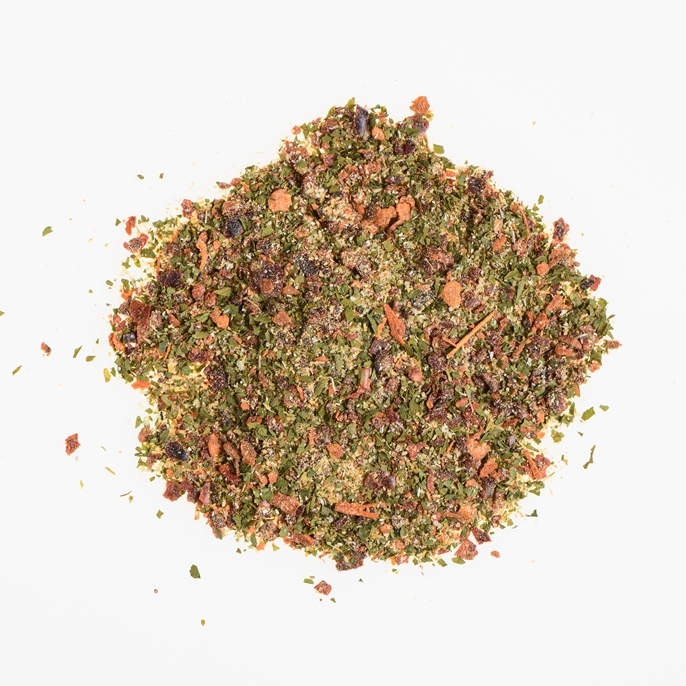 Mix of spices to enhance the flavour of all kinds of salads and vegetables. Also to prepare vinaigrettes and sauces. 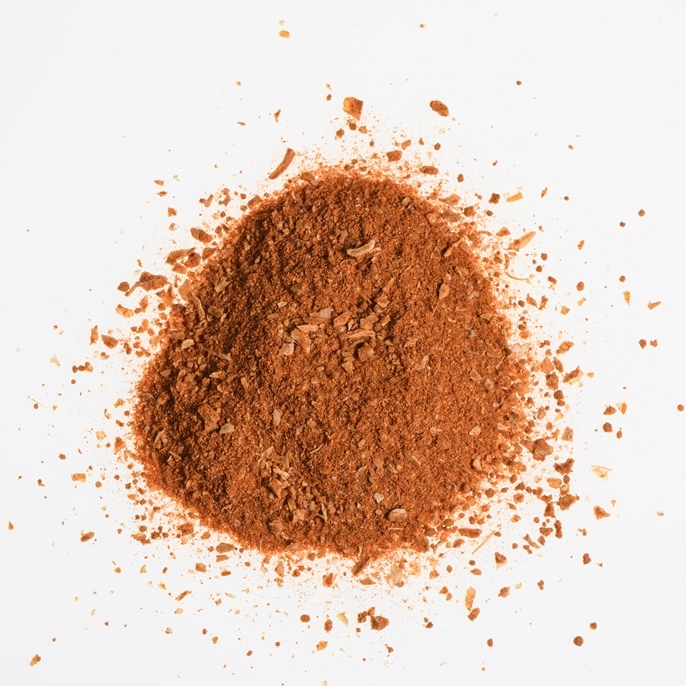 Mix of spices to give the distinctive touch to Italian pasta. Especially useful for spaghetti and macaroni. 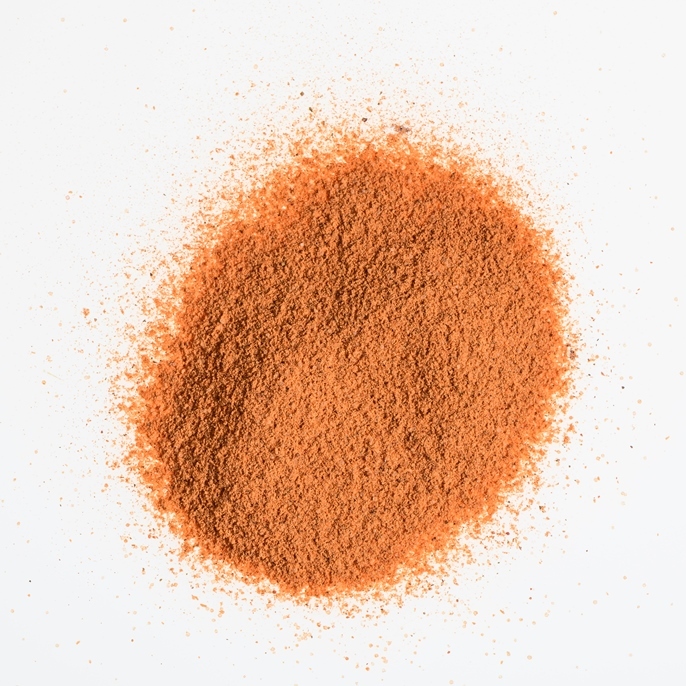 Mix of all necessary spices to flavour this typical dish of Spanish cuisine. It includes pices of garlic and parsley. Mix of spices to season avocados in this tipical recipe of Mexican cuisine. 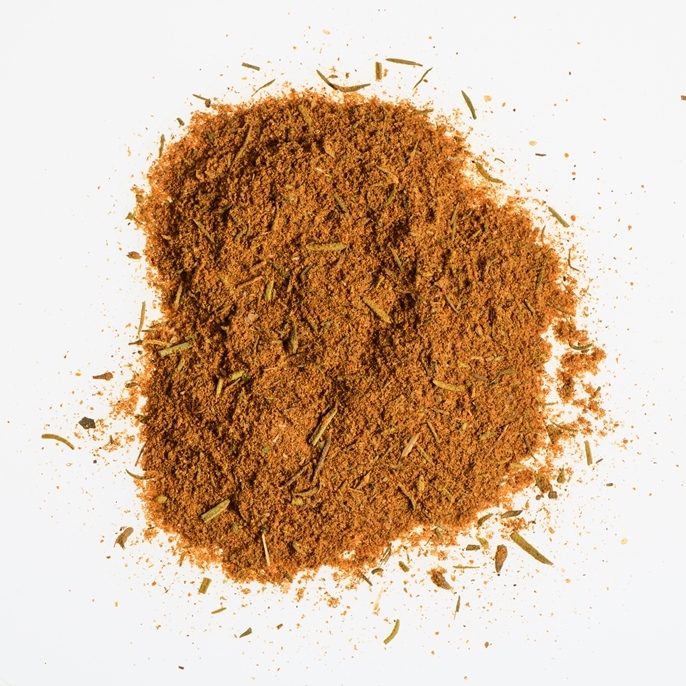 Mix of spices to flavor this typical Greek style meat. Mix of spices to flavour this type of dish of the Arab cuisine. 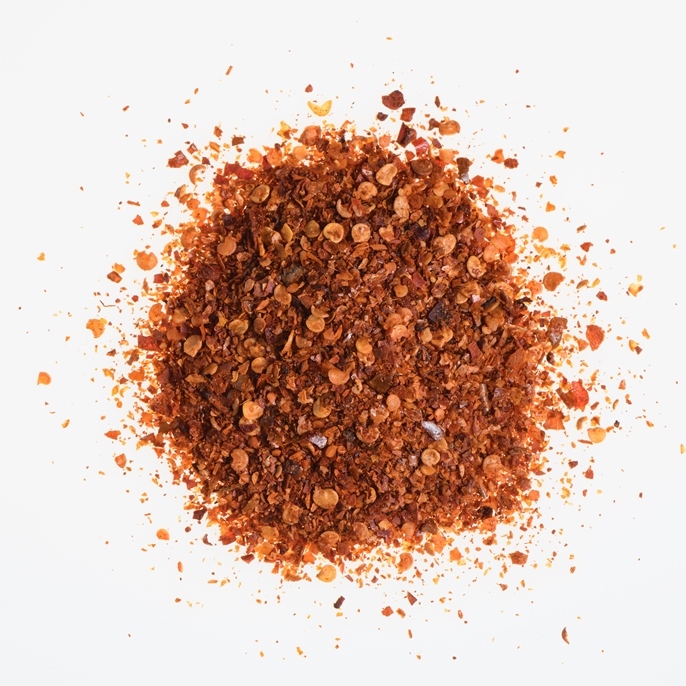 Mix of spices to prepare Moroccan style minced meat. 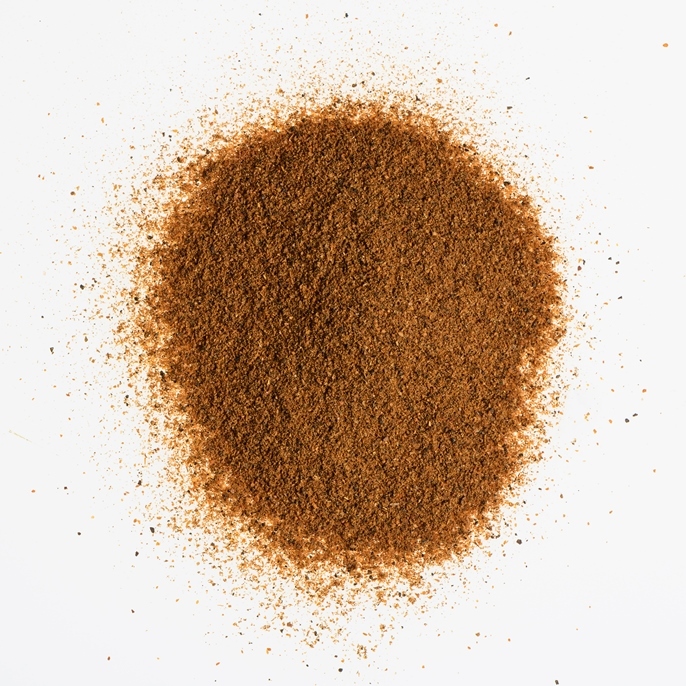 Mix of spices to flavour all kinds of dishes with seafood. Mix of spices to flavour this typical dish of North African cuisine – whole lamb or sheep slowly spit-roasted on a barbecue. Mix of spices to prepare oriental style rice dishes. It contains green cardamom and cloves. Mix of spices to flavour all kinds of pasta. It contains garlic, onion, green and red pepper, among other ingredients. Mix of spices to flavour all kinds of potatoes. 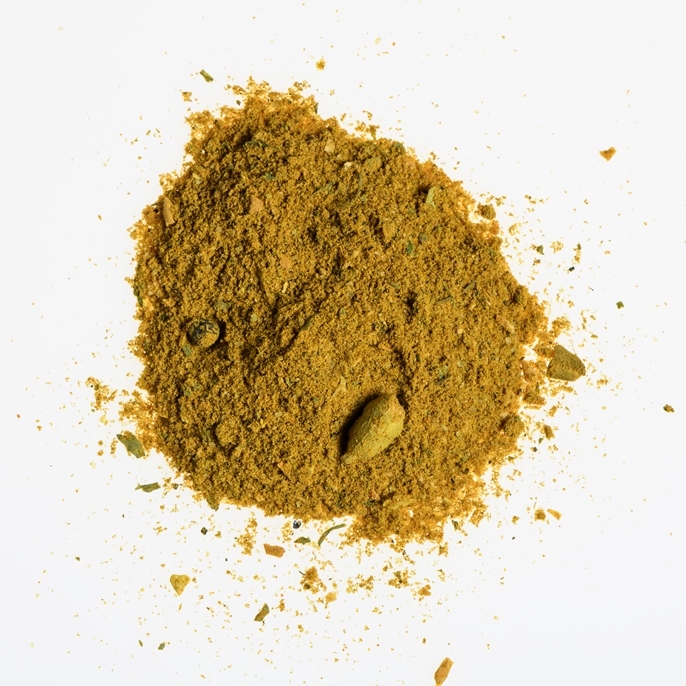 Exquisite mix of spices for stews, sauces and roasted fish. It enhances the flavour of all types of fish. 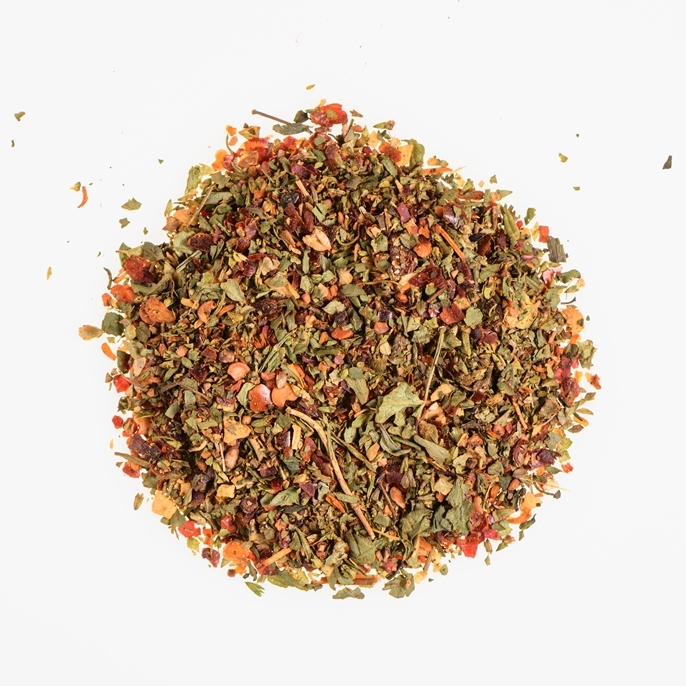 Oriental style blend of spices for stews, sauces and roasted fish. 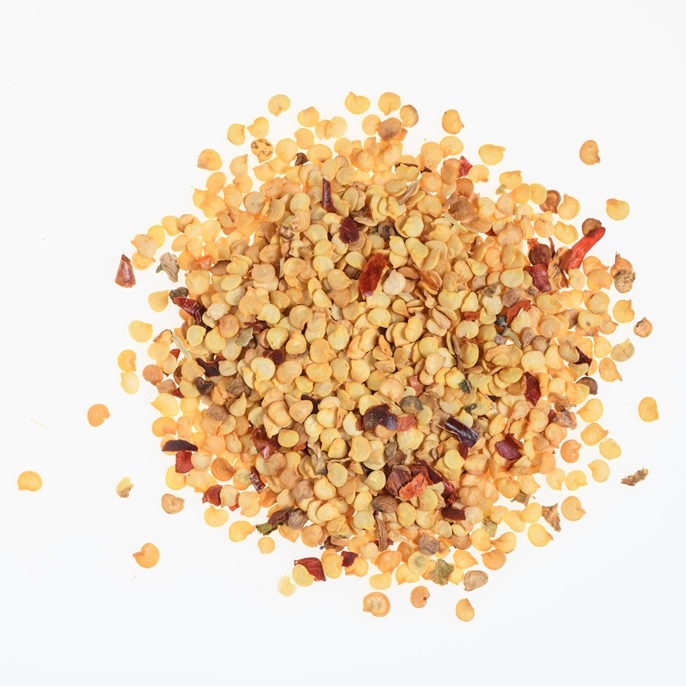 Mix of spices of hot flavour for the preparation of skewers and meat in general. 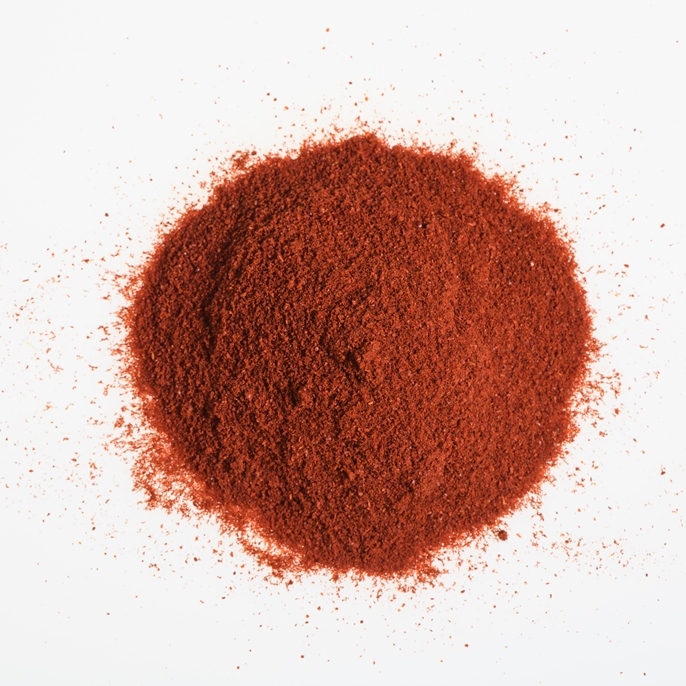 Red colour (paprika base). Careful selection of spices and herbs components of traditional pizza. 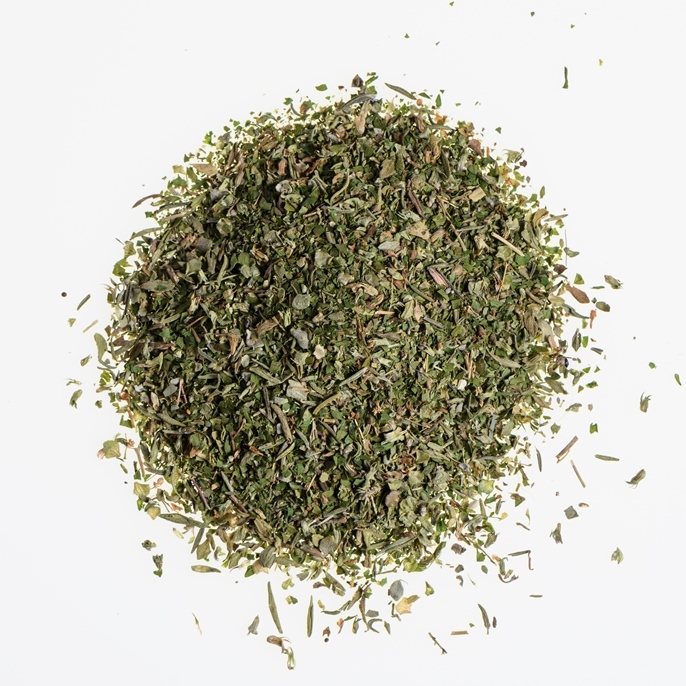 Provides the right flavour with oregano as one of the main ingredients. 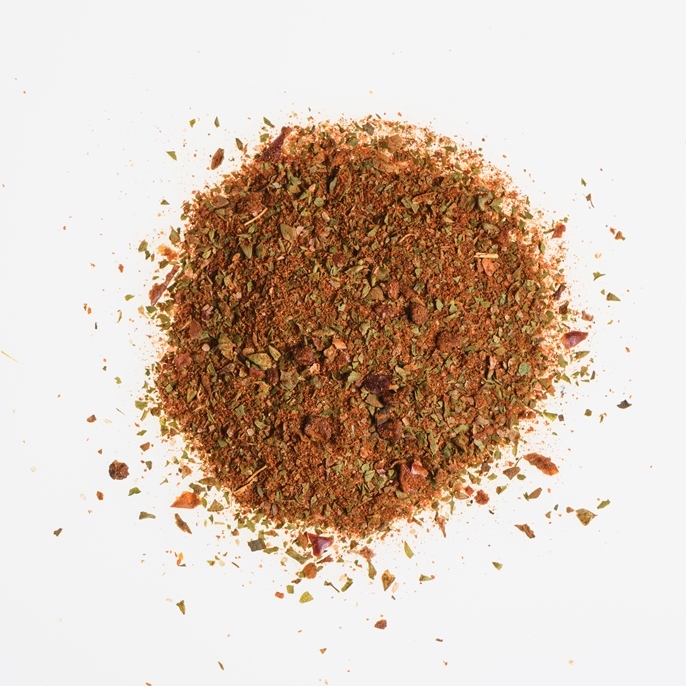 Arabic style mix of spices for chicken and poultry in general. Mix of spices to flavour poultry. Mix of spices to cook this typical Arabic dish. 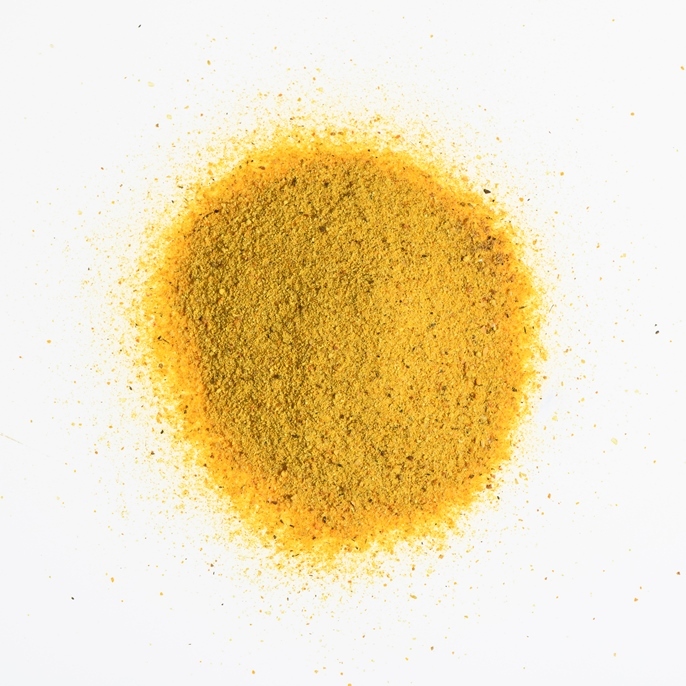 Yellow colour (turmeric base). Mix of spices to cook this typical Arabic dish. 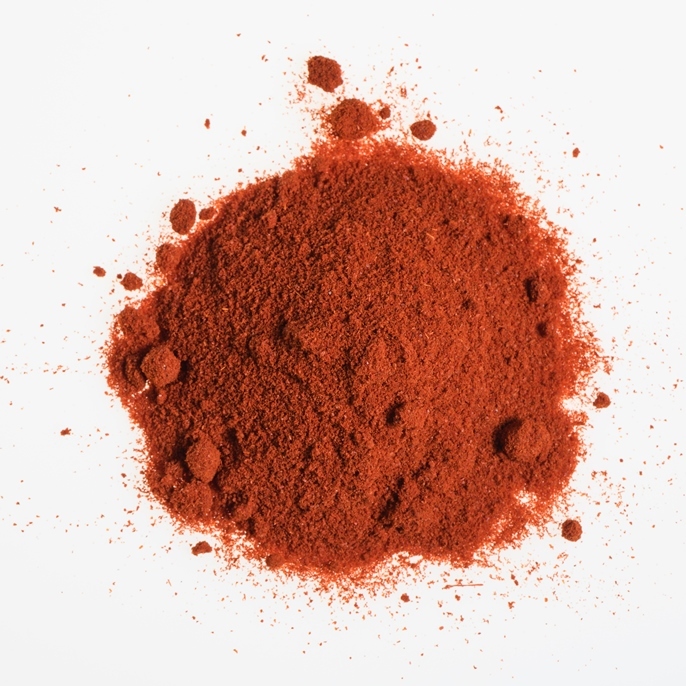 Red colour (paprika base). 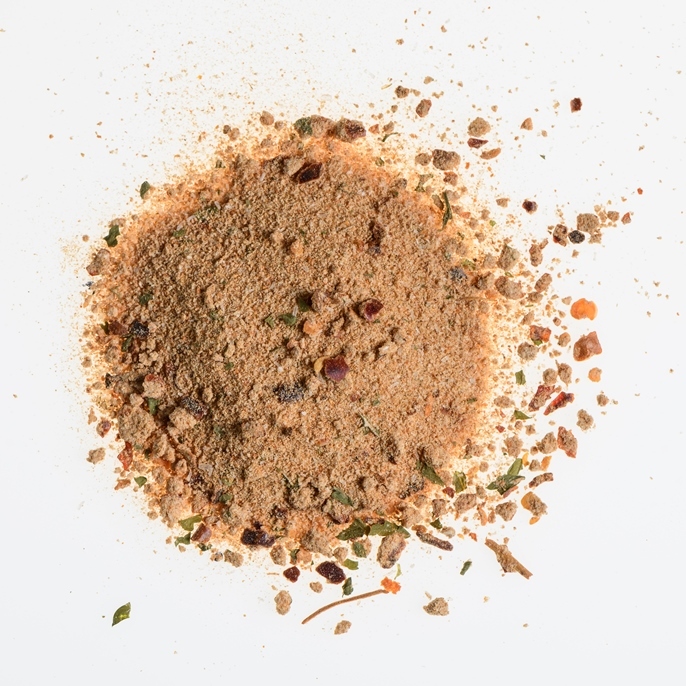 Spice mix to flavour this traditional Turkish street food dish. To be sprinkled over chicken, beef and lamb before grilling or roasting. 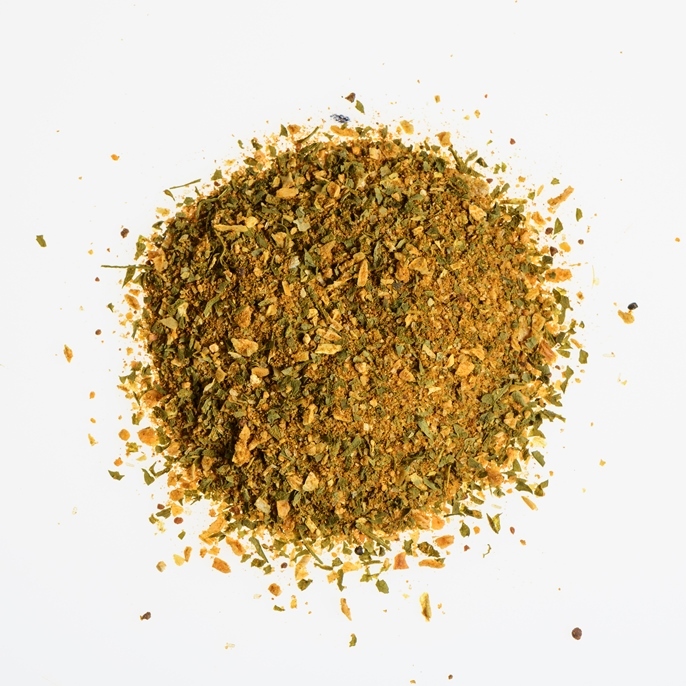 Spice mix to flavour this traditional Turkish street food dish. Specialy designed for chicken. Mix of all necessary spices to flavour this typical dish of Mexican cuisine. 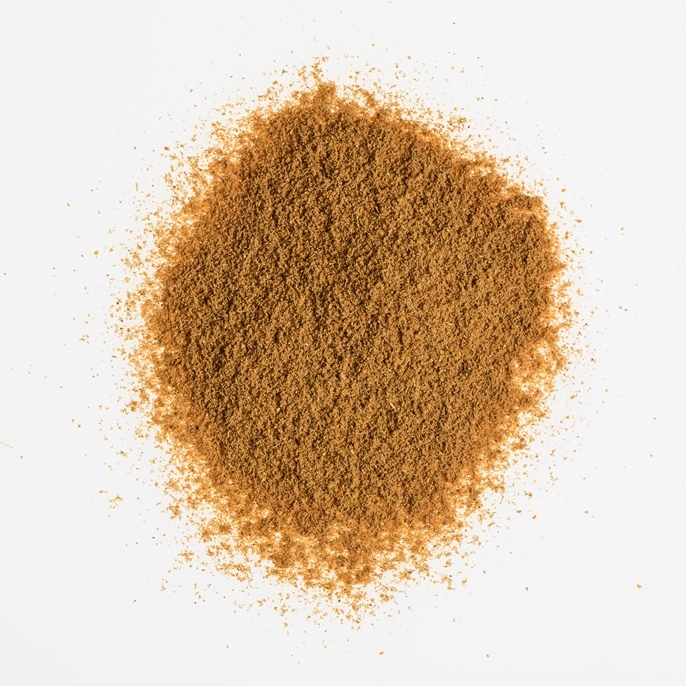 Mix of spices to flavour this typical dish of Moroccan cuisine. 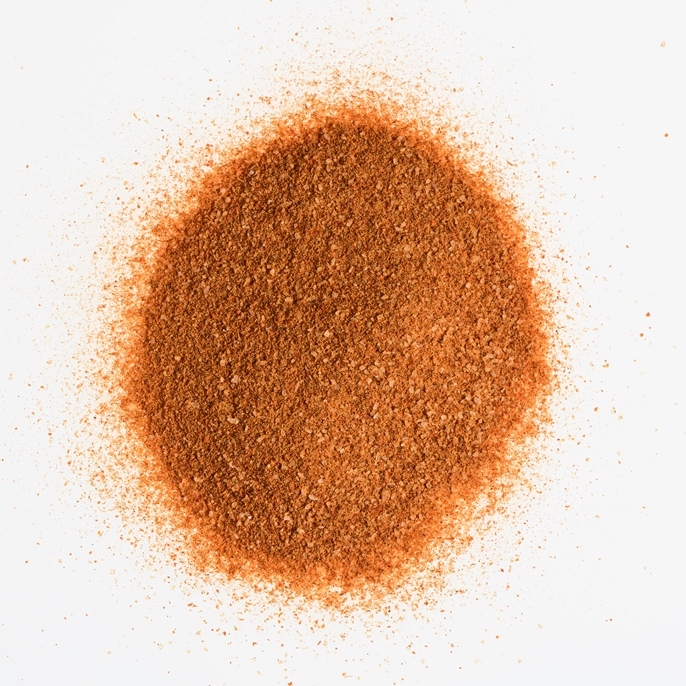 Mexican style seasoning for all kinds of dishes, from scrambled eggs, tacos, burritos to meat, poultry and fish. 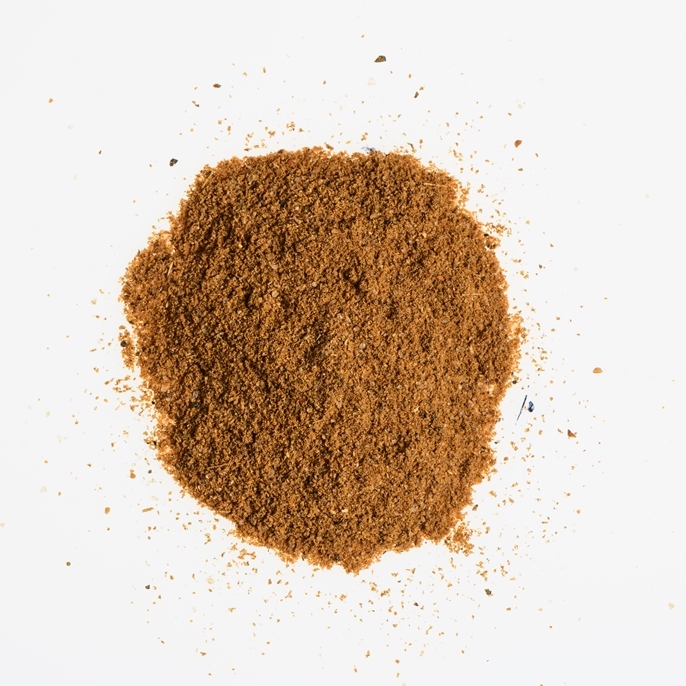 Spice mix widely used in the kitchen of India and Pakistan. 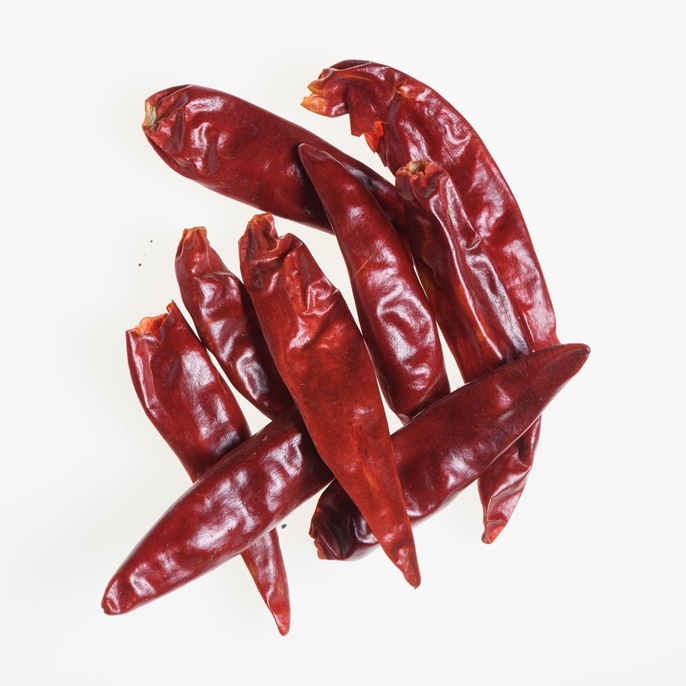 It has an intense red colour transferred to the food while cooking, giving it a very exotic touch as well as a pleasant spicy flavour. 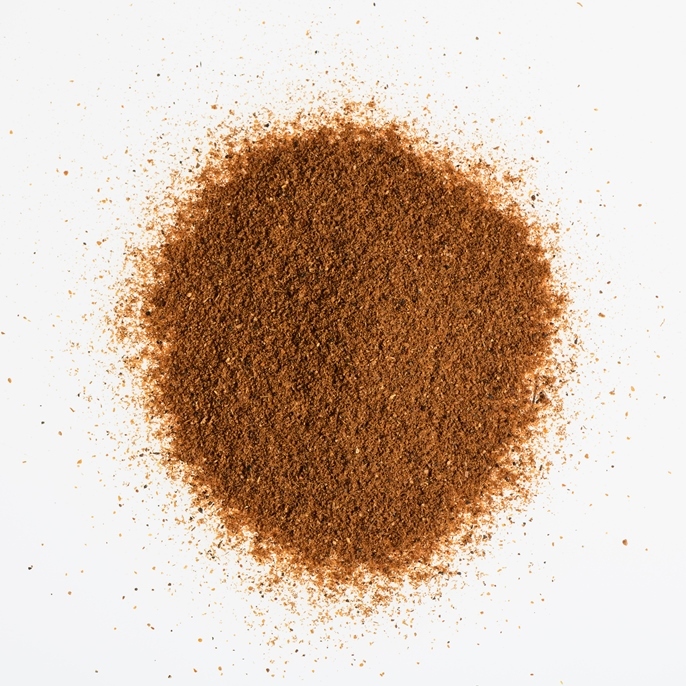 Spice blend to flavour yogurt or sour cream for this typical Greek style dip. Great with souvlaki and gyros as well. 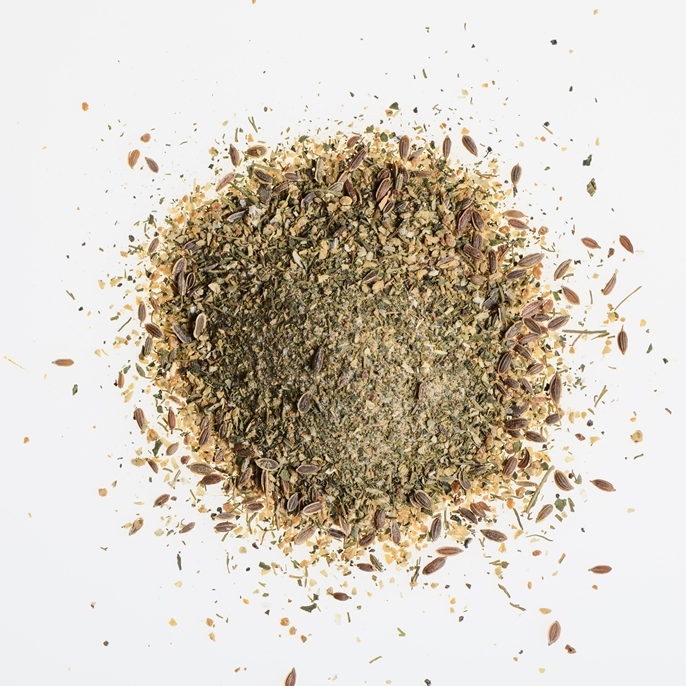 Mix of spices and seeds very popular in the Middle East, mainly in Syria, Jordan, Lebanon. 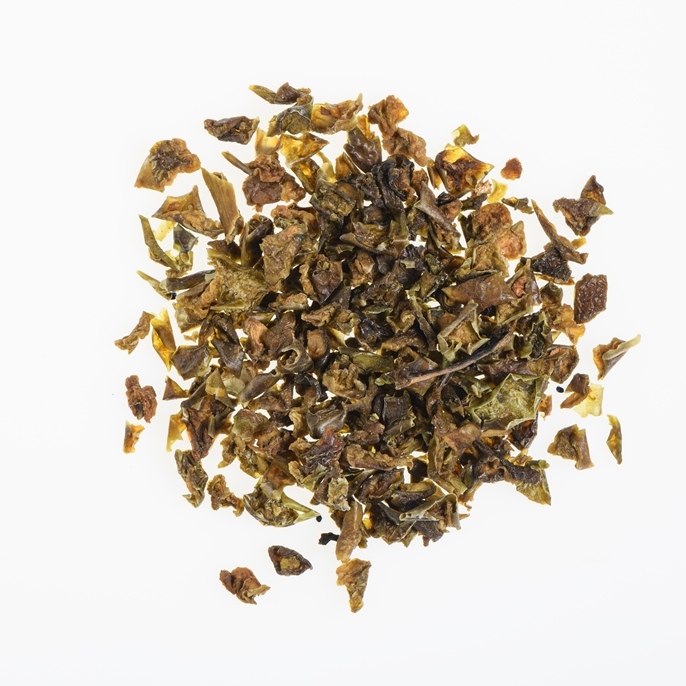 Its flavour is slightly acidic and aromatic. 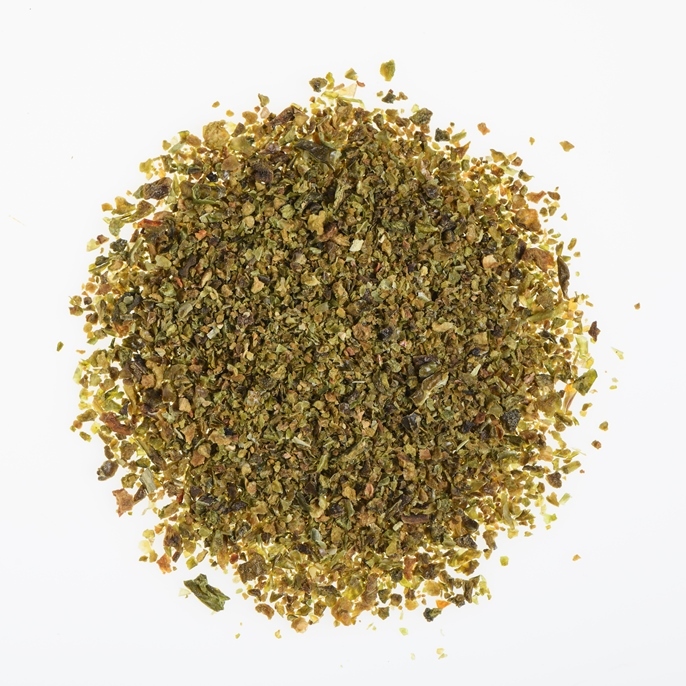 It is used to season grilled meats and vegetables or to mix with olive oil to form a dip. 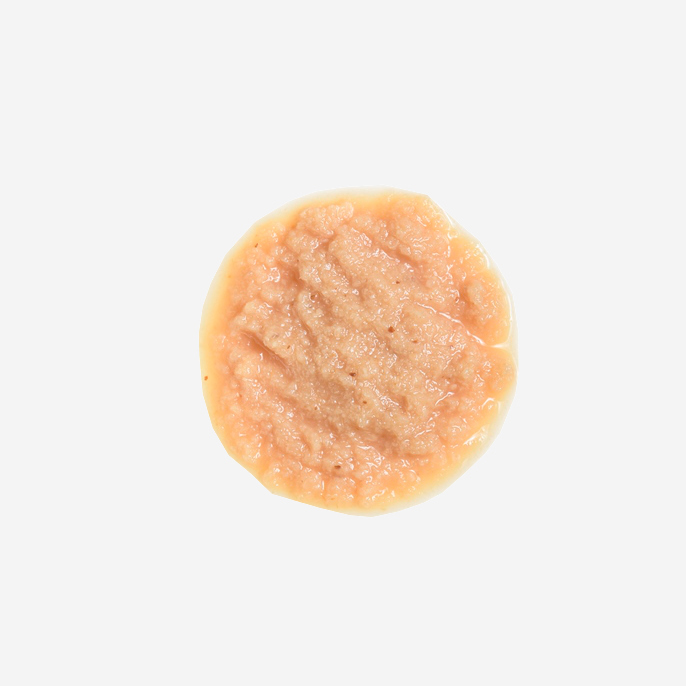 Garlic pulp obtained after washing and peeling fresh garlic. Aroma and characteristic flavour of fresh garlic. It contains a little salt. Mix of sugar and vanillin to get a sweet product (sugar), of white colour and vanilla-flavoured. 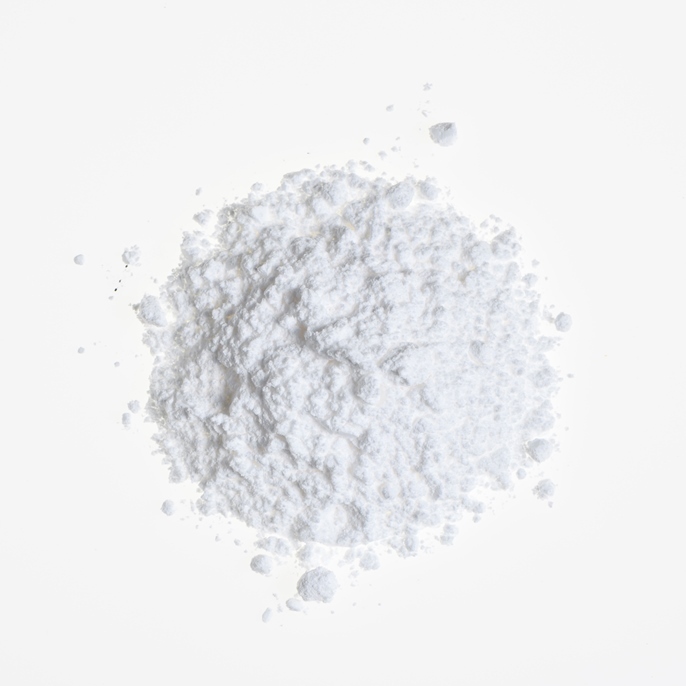 Sodium hydrogen carbonate (NaHCO3). 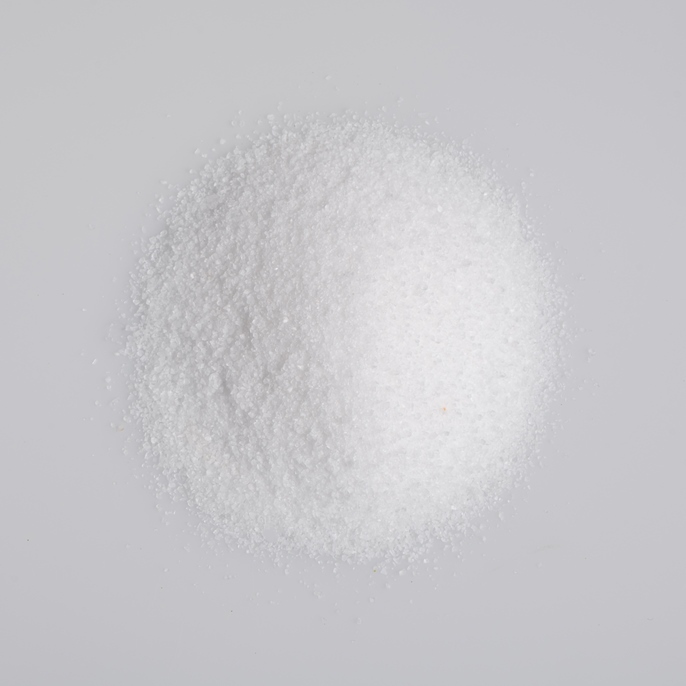 Crystalline mass or crystalline powder, colorless or white, salty in taste, soluble in water and insoluble in ethanol. 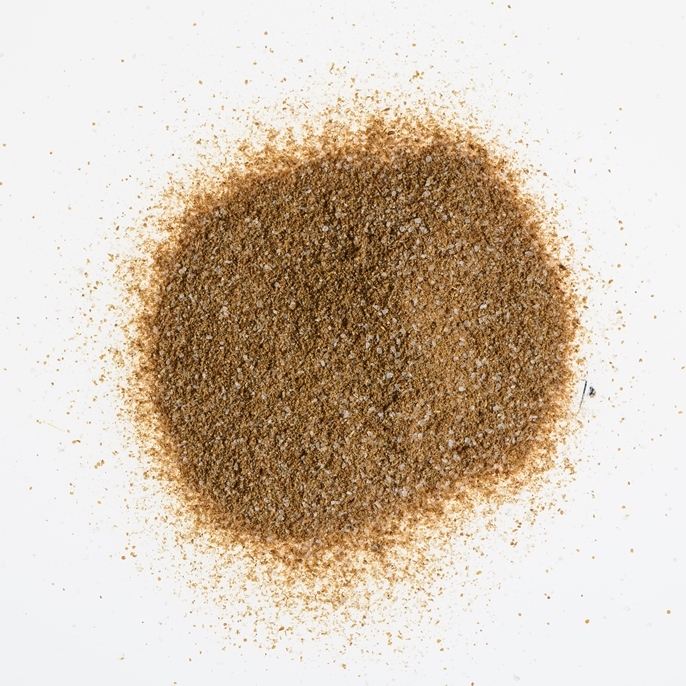 Salt obtained in Murcia (Spain) from the evaporation of seawater. 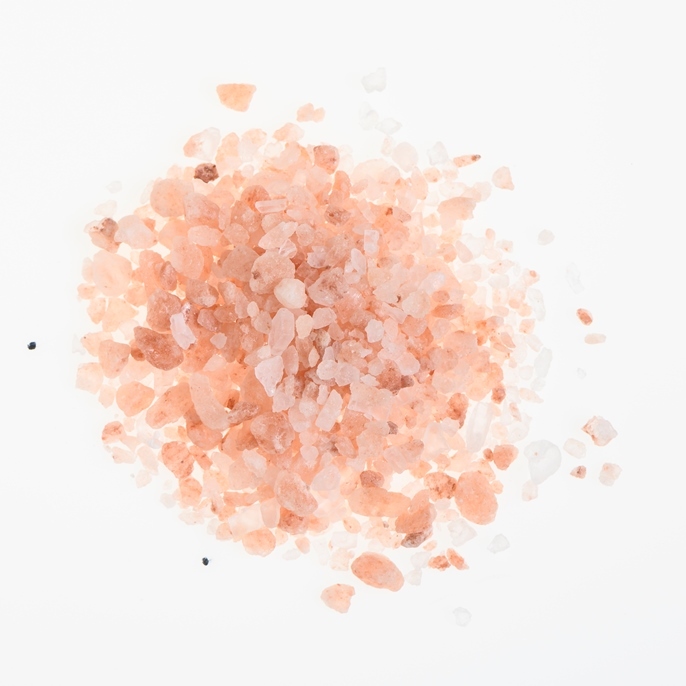 Pink mineral salt from the mountains of Pakistan. Coarse. 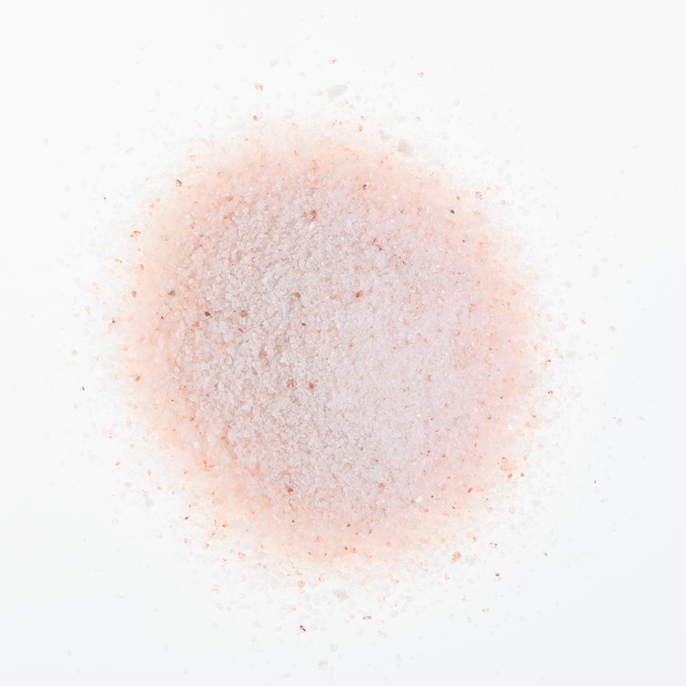 Pink mineral salt from the mountains of Pakistan. Thin. 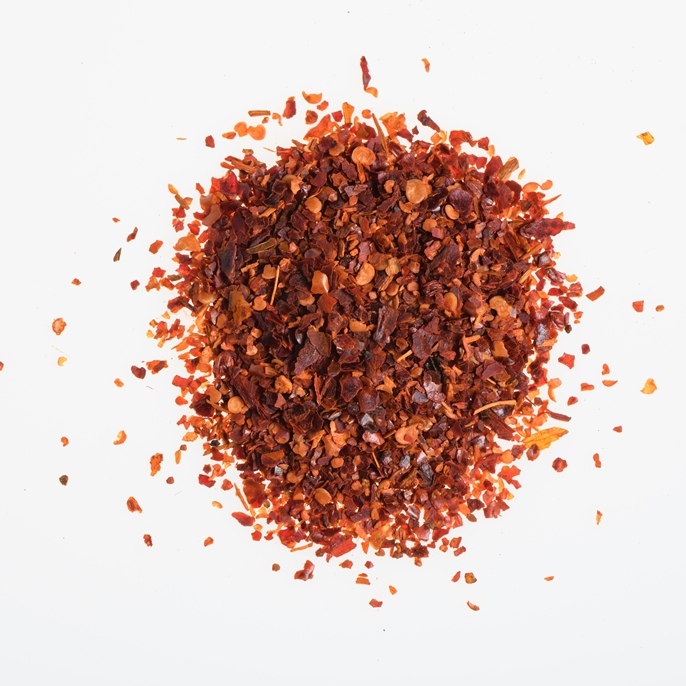 Product obtained by grinding fresh, ripe and washed peppers. 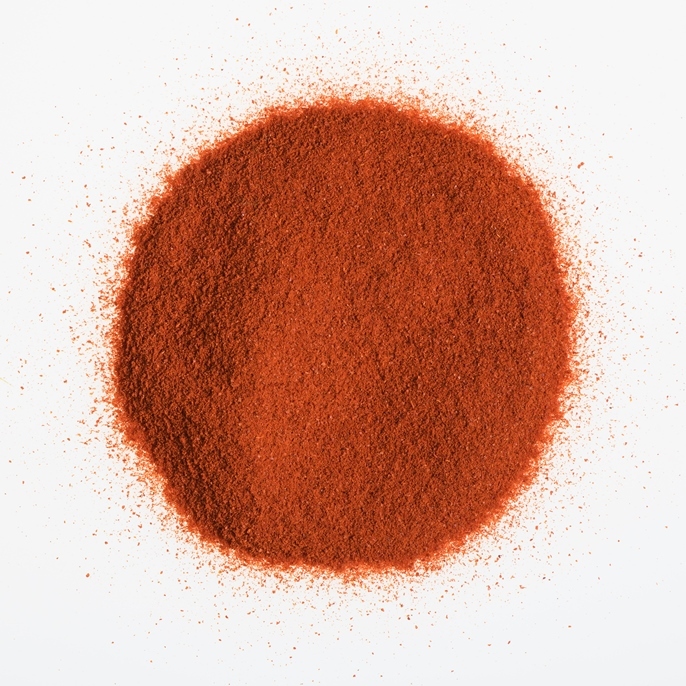 One kilo of paprika paste equals 5 kilos of fresh peppers. It contains a little salt. 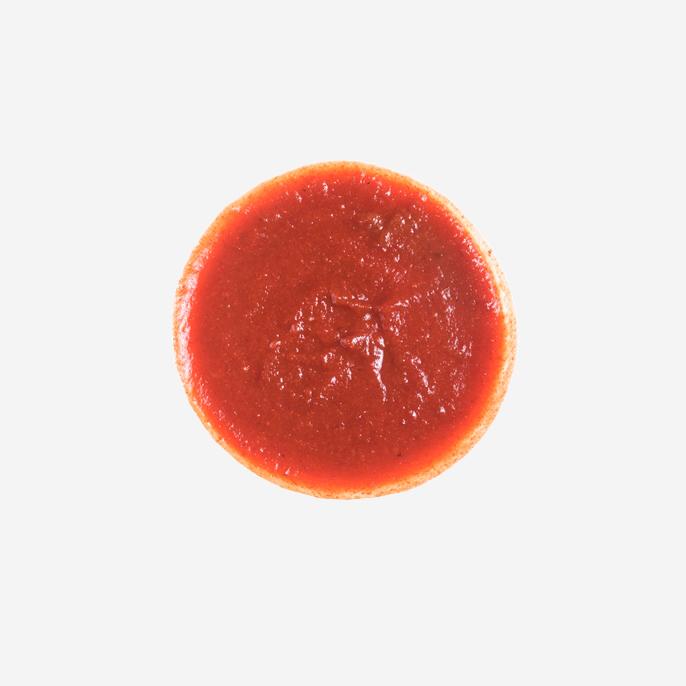 Cooking sauce prepared by mixing and dissolving its components, obtaining a homogeneous and stable product with spicy, strong and energetic taste. 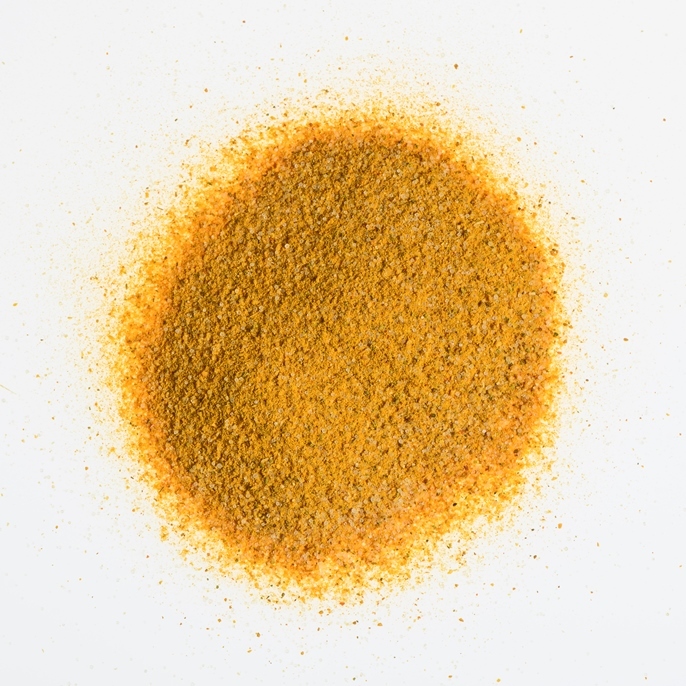 Coloring obtained by the mixture of tartration with inert diluents that facilitate its use. 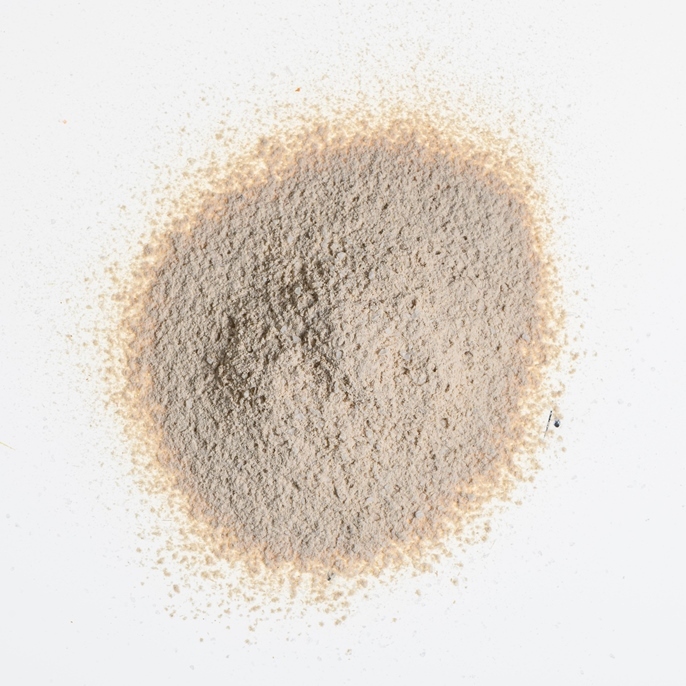 It is manufactured in 4 grades according to the concentration of tartrazine (nº6, nº12, nº25, nº50). Immature, clean, dry and cut fruits of green pepper Capsicum annuum. 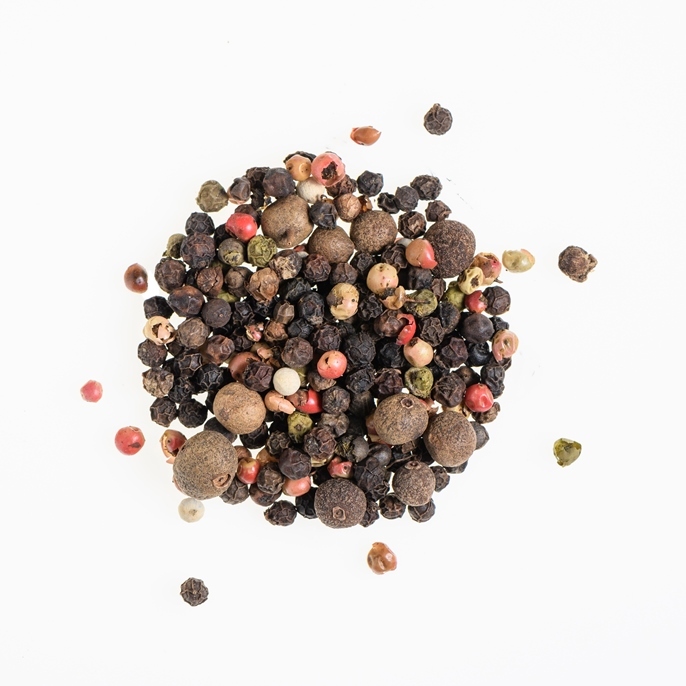 Aroma and sweet flavour typical of pepper. The rehydration factor is approximately 6: 1. Aprox.size is 1-3mm. 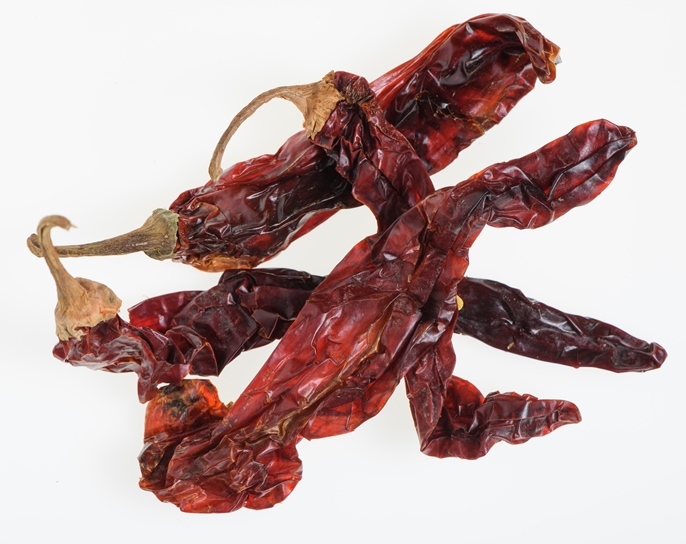 Ripe, clean, dry and chopped fruits of red pepper Capsicum annuum. 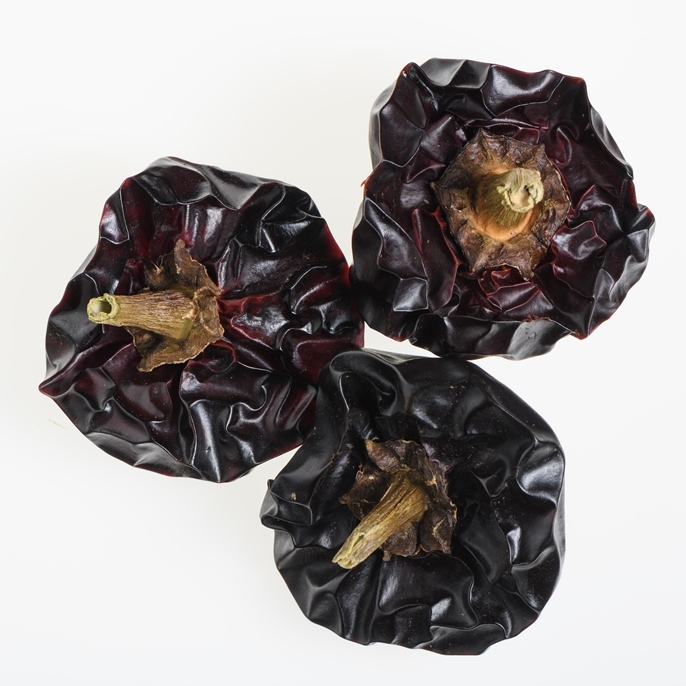 Aroma and sweet flavor typical of pepper. The rehydration factor is approximately 6: 1. Aprox.size is 1-3mm. Immature, clean, dry and cut fruits of green pepper Capsicum annuum. 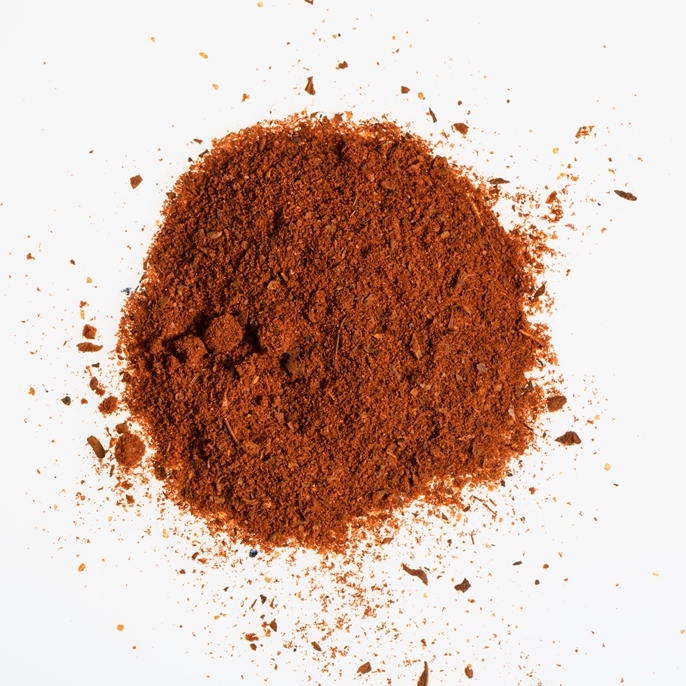 Aroma and sweet flavour typical of pepper. The rehydration factor is approximately 6: 1. Aprox.size is 9*9mm.